In no event shall Beisan Systems, LLC or its members be liable for incidental, consequential, or special loss or damages of any kind however caused. 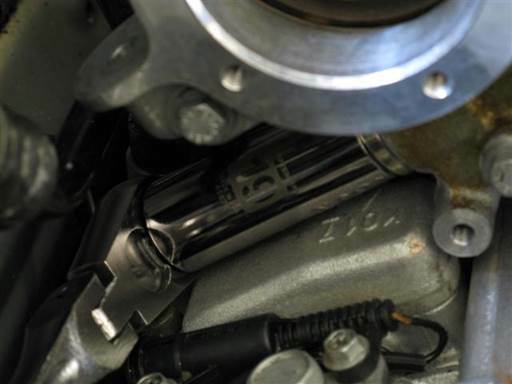 “Vanos” is BMW’s name for its variable valve timing units. 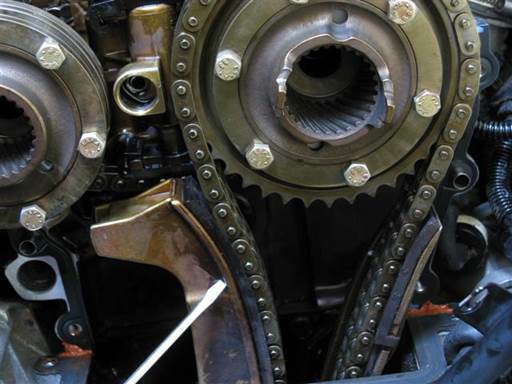 Vanos units take on various shapes and design according to car year and model (engine model). 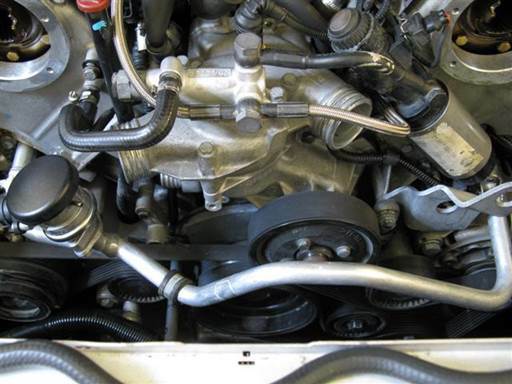 The vanos units discussed here are BMW part # 11-36-7-831-486 and 11-36-7-831-487. 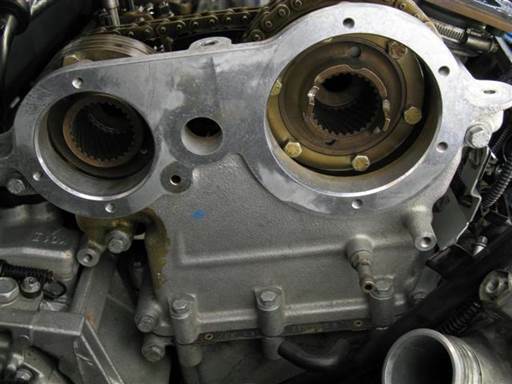 They are a double vanos, meaning both the intake and exhaust valve timing is varied. 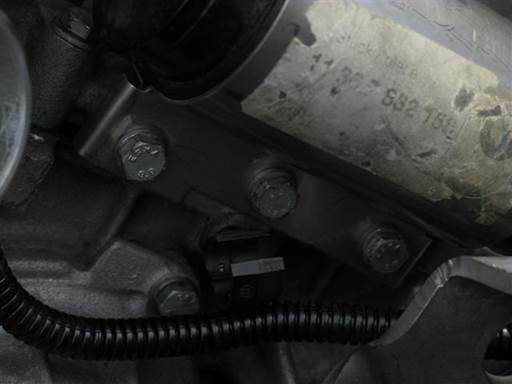 These vanos units are identical with only the solenoid pack and solenoid cover installed in reverse. They are part of BMW 8-cylinder engine S62. This engine is incorporated into the E39 M5 98-03, E52 Z8 Roadster 99-03. 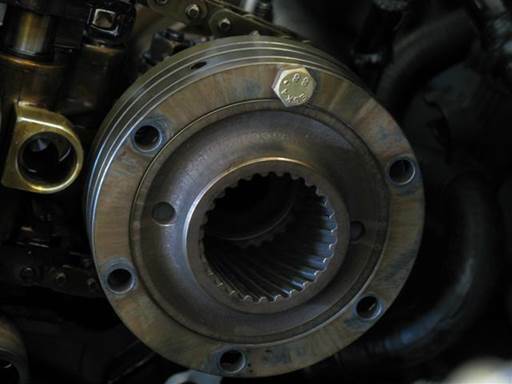 This vanos, like most vanos designs, can develop a rattle. 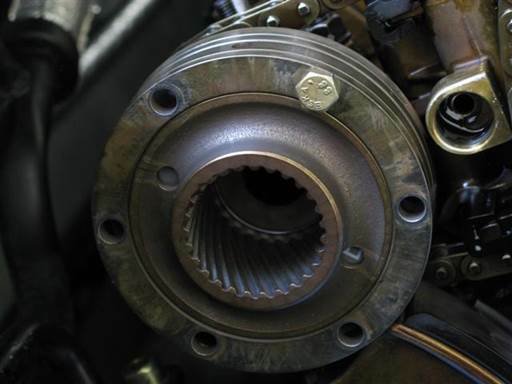 The vanos rattle is caused by wear in the variable valve timing helical (slanted) gears. 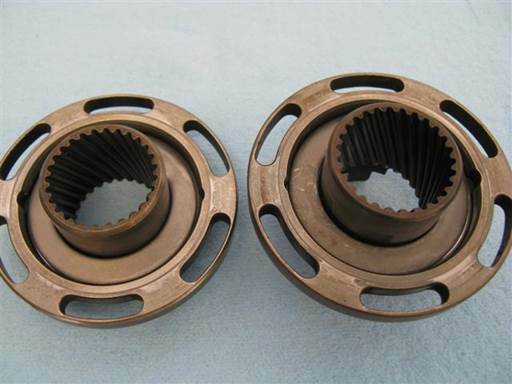 These gears are found on the camshaft sprocket and splined shaft, which attaches to the vanos. 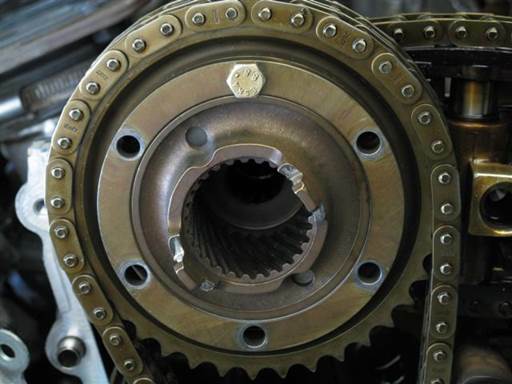 The helical gear wear allows the camshaft to have lash movements that engage the splined shaft axially. At certain RPMs these movements resonate and engage axial play (free space) and cause associate components to hit and rattle. 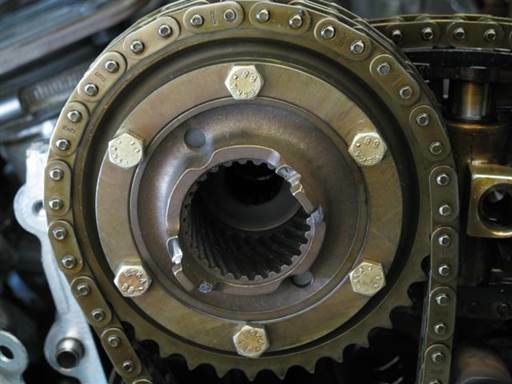 The axial play that facilitates the rattle is found on the helical gears and the splined shaft bearing. 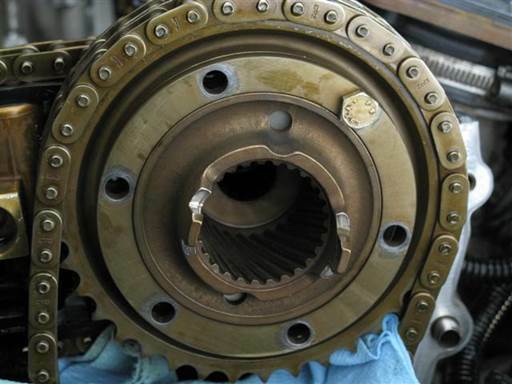 Replacing the helical gear components is expensive and the gears will wear again and the rattle will return. 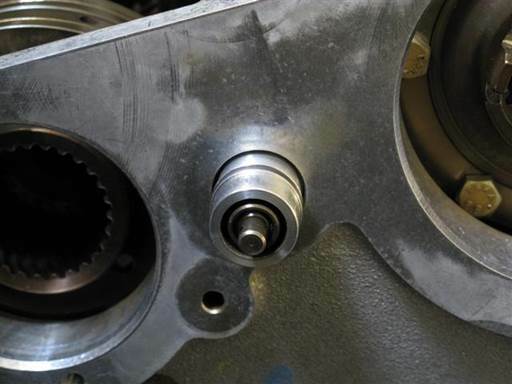 Removing the splined shaft bearing axial play significantly reduces the rattle to the point where it’s barely heard or not heard at all in the passenger compartment. Performance cams like the ones on this engine create stronger camshaft lash forces and thus are more susceptible to causing a rattle. 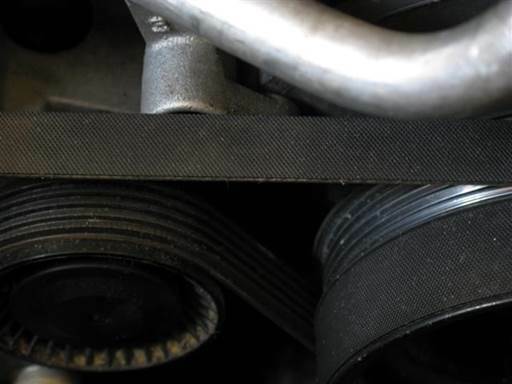 Another component that addresses the rattle is the diaphragm spring that’s incorporated in the intake and exhaust sprockets. 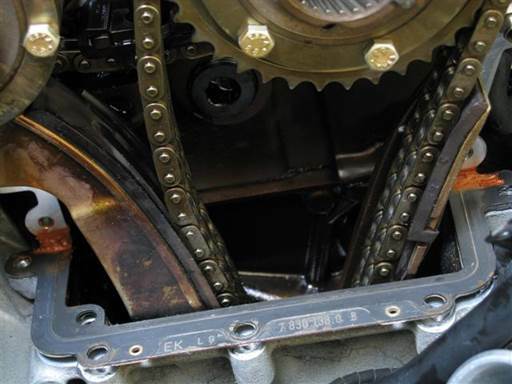 This spring loads the sprocket rotational movement to dampen the rattle quick movements. Over time the diaphragm spring weakens and degrades in function. 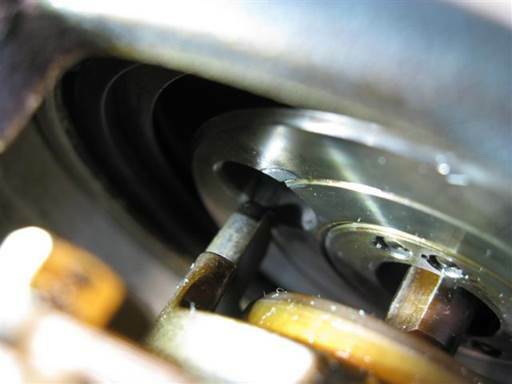 Replacing the diaphragm spring with a new one is often needed to fully resolve the rattle. 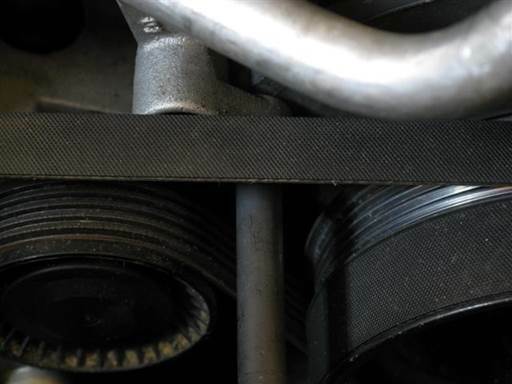 The S62 diaphragm spring was redesigned by BMW and is now thicker. This new part is more effective and lasts longer. It was incorporated into the S62 engine starting model year 02 cars. 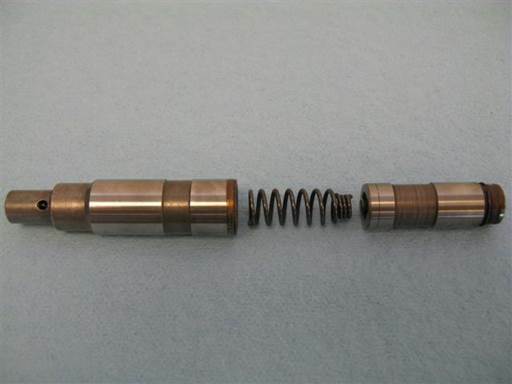 For an in depth discussion of the rattle cause and solution reference the Beisan single and double rattle procedure and single diaphragm spring procedure introductions. 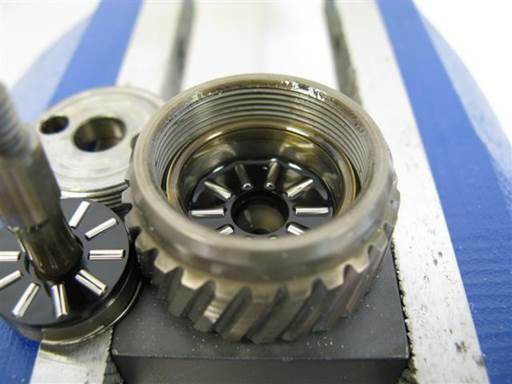 The splined shaft bearing is made of a thick washer and two thrust (roller) bearings. 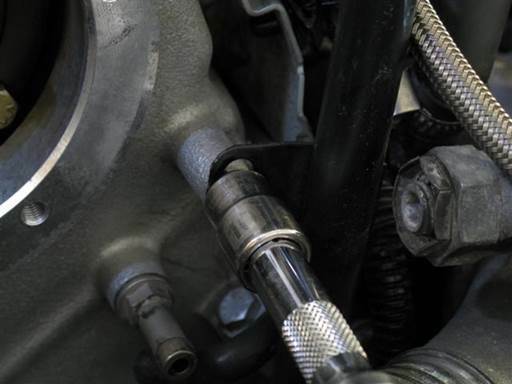 The washer incorporates a stud that’s mounted to the vanos piston. 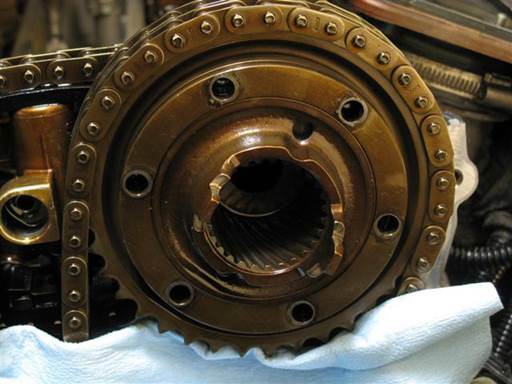 The two thrust bearings sandwich the washer facilitating the splined shaft to rotate at camshaft speed without rotating the vanos piston. The washer and two thrust bearings are incased in a ring and two outer flat washers. The complete bearing is housed inside a splined shaft cavity and is closed off with a threaded cover. 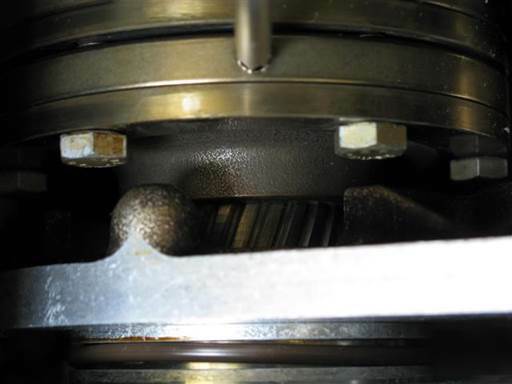 Removing the splined shaft bearing axial play requires modifying or replacing one or more bearing components. 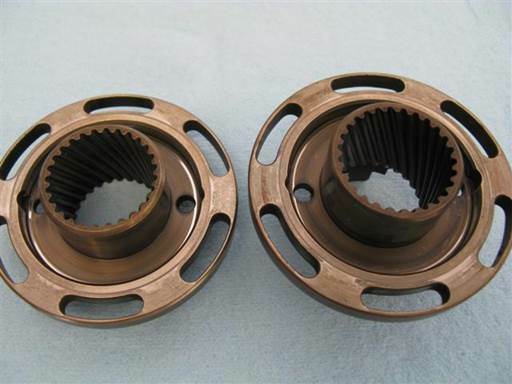 The thrust bearings are a standard part and are manufactured to tight tolerances. It’s not feasible to modify or replace them. The center washer is also manufactured to a tight tolerance. The ring is a non-standard part and is manufactured to loose tolerance. It’s also made of standard steel that is annealed (soft). This is causing it to be scored by the center washer and thrust bearing. 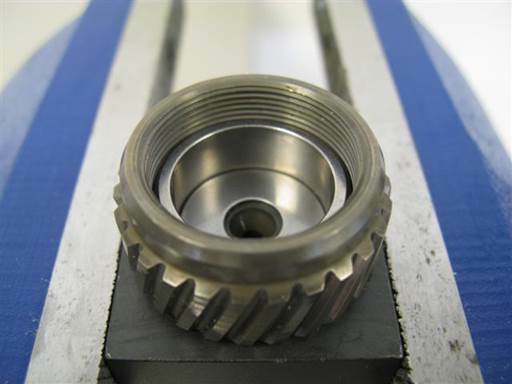 The outer flat washers reside inside the ring and thus influence the bearing axial fit. 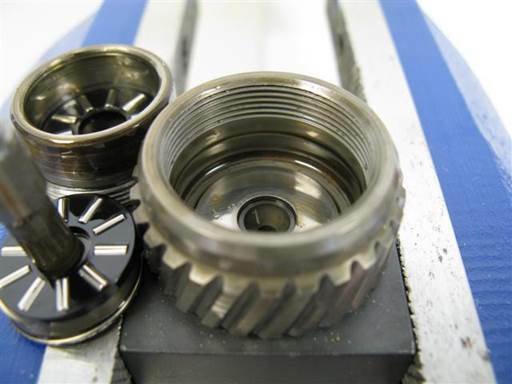 The washers are a standard bearing part, but due to their stamped manufacturing have a notable tolerance range which can significantly affect the bearing axial fit. 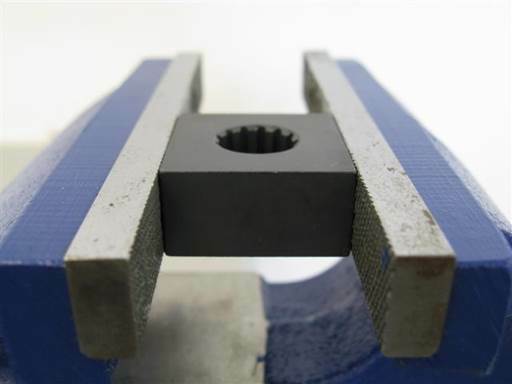 The ring can be replaced with a ring made of bearing steel that’s hardened and ground to bearing standards. Its height can be tightly controlled to provide a tight bearing axial fit. Standard bearing washers that have been measured and sorted can be combined to provide the needed height to provide a tight bearing axial fit. 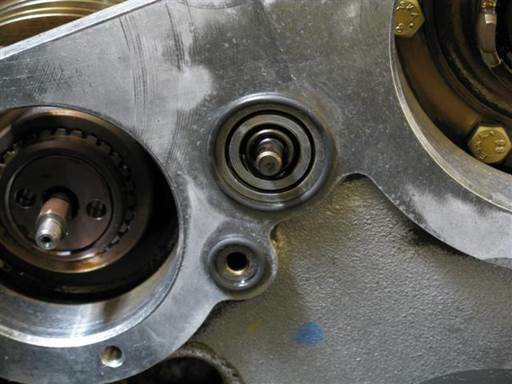 A bearing adjustment can be made at installation to address any minor axial fit variation. 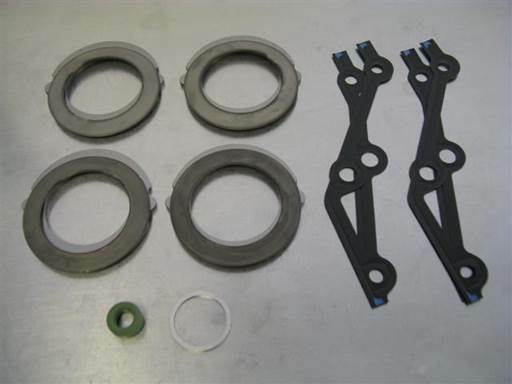 The vanos rattle repair kit includes four sets of replacement bearing ring and two outer washers. 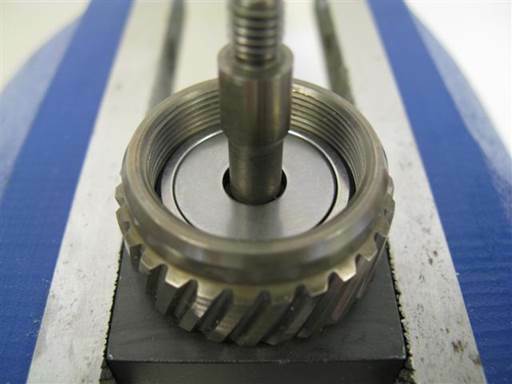 Opening the splined shaft to modify the bearing requires counter holding the splined shaft and unscrewing the cover. The splined shaft doesn’t have a built in area for tool holding, and the cover only has two holes in it for manipulation. 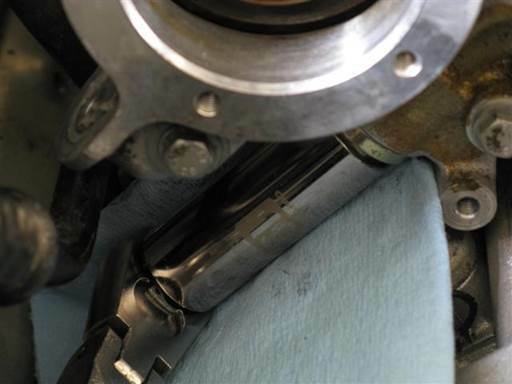 The cover threads also have high strength thread locker which makes cover removal difficult. 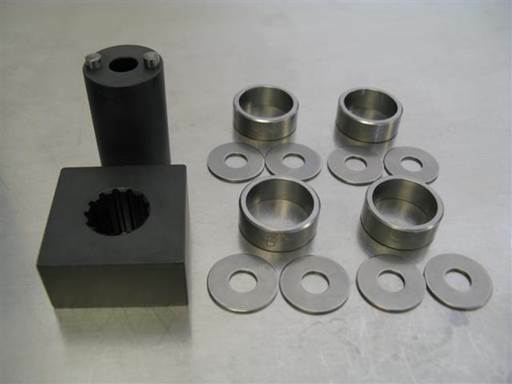 A splined shaft holder tool is needed to receive and hold the splined shaft, and a socket tool with dowels is needed to insert into the holes in the splined shaft cover and open and close it. The vanos rattle tools includes a splined shaft holder and splined shaft socket. 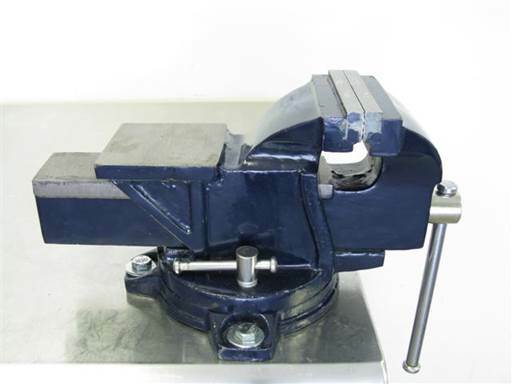 The holder is square and mounts in a vise and receives and counter holds the splined shaft. The socket is a standard 1/2” drive size and has dowels that mount into the splined shaft cover holes to open and close the cover. 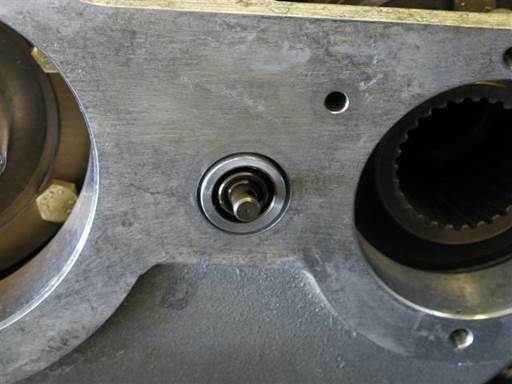 The socket is designed to be used with an impact wrench to overcome the cover thread locker. The socket is also used with a torque wrench for final tightening. The vanos rattle repair kit and rattle tools can be acquired through Beisan Systems (bee-saan), www.beisansystems.com/products. Vanos rattle at a certain RPM range, often 1800-2200 RPM. Rattle can also occur at idle. 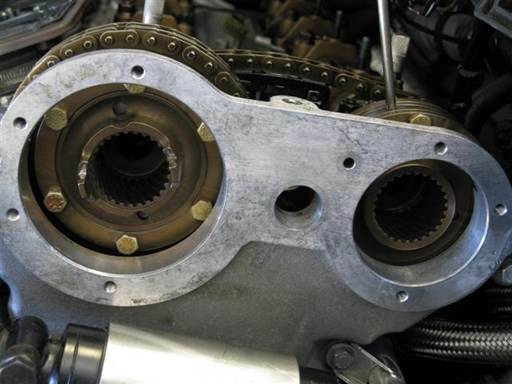 The following is an S62 vanos splined shaft bearing rattle repair procedure. 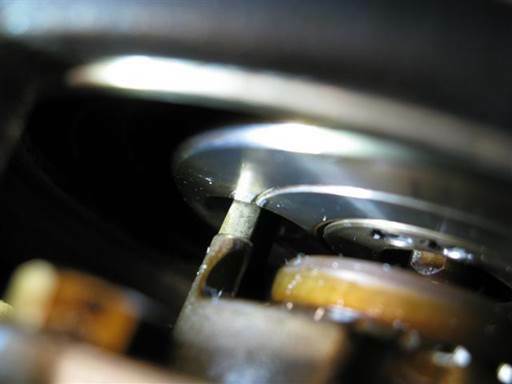 As part of the repair the sprocket hub diaphragm springs and associate pressure plates are replaced with S62 parts. The S62 parts have been redesigned and have a thicker/stronger diaphragm spring to better control the rattle. 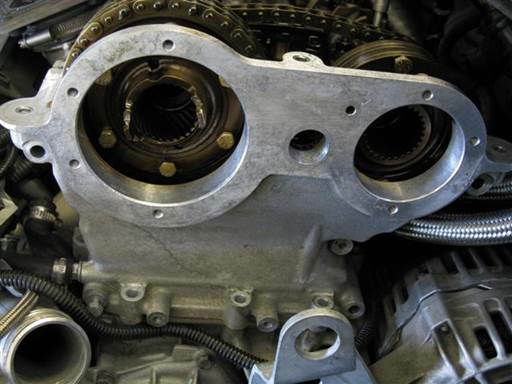 This repair is performed in conjunction with the S62 vanos seals repair. Repair time: 5 hours mechanic, 6+ hours DIY, in addition to specified time in vanos procedure. 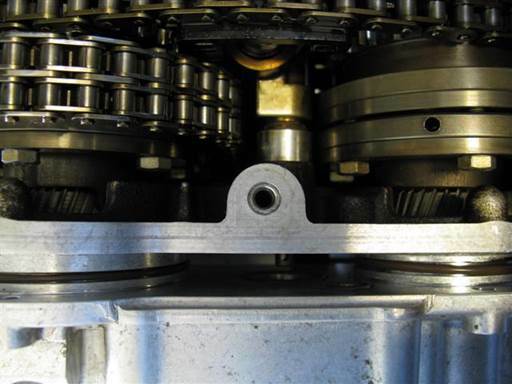 Note: BMW changed the design of the sprocket hub diaphragm springs to thicken the spring to make it function better and last longer. This design is incorporated in 02+ MY cars. Note: Vise must be mounted for use. Turn crankshaft pulley clockwise one full rotation until timing marks match again (32mm socket 1/2” / 1/2” long-arm ratchet & short extension). When 3/4 through turn start inspecting TDC (top dead center) timing marks on engine timing cover and crankshaft harmonic balancer at ~11 o’clock position (mirror). 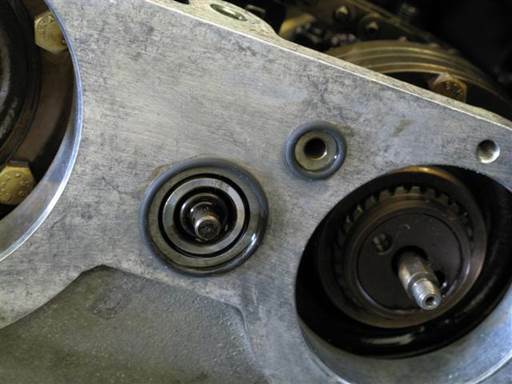 Adjust crankshaft pulley to align TDC timing marks (32mm socket 1/2” / 1/2” long-arm ratchet & short extension). Note: Timing marks are far from each other and thus difficult to align. 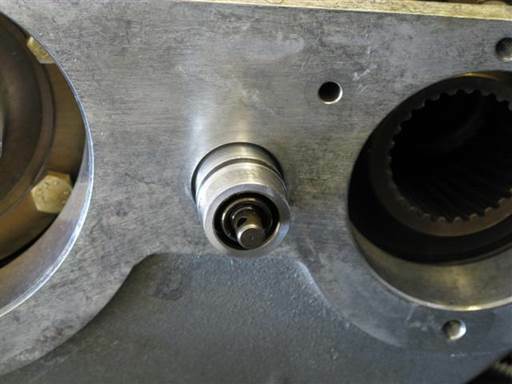 It is easier to align locking pin holes in harmonic balancer and locking bracket (picture). Note: Turning crankshaft counter clockwise is acceptable. Note: Precise alignment is not necessary. Loosen bank 1 & 2 intake and exhaust hub top accessible bolts. For each bank perform following. Loosen intake and exhaust sprocket hub 3 (each) top accessible mounting bolts two rotations (10mm open wrench). Adjust crankshaft pulley to precisely align TDC timing marks (32mm socket 1/2” / 1/2” long-arm ratchet & short extension). 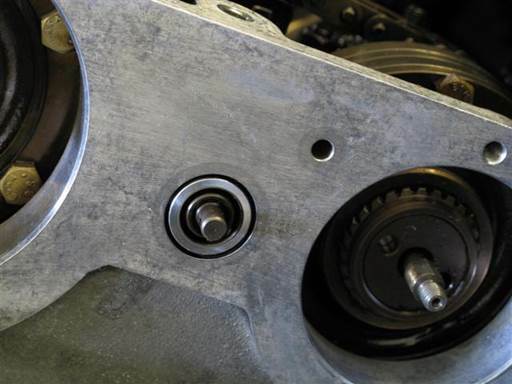 Install crankshaft locking pin in timing cover bracket hole. If pin not inserting repeat above step to achieve precise timing alignment. Lock banks 1 & 2 intake and exhaust camshafts. For each bank perform following. 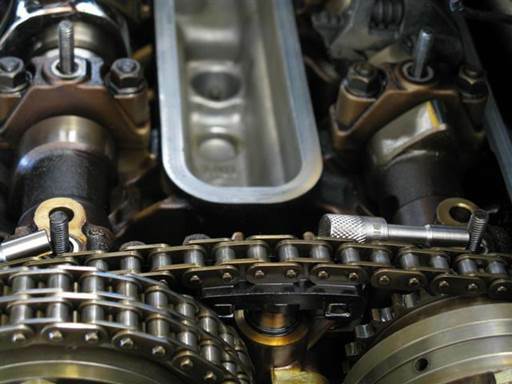 For intake and exhaust camshafts perform following. 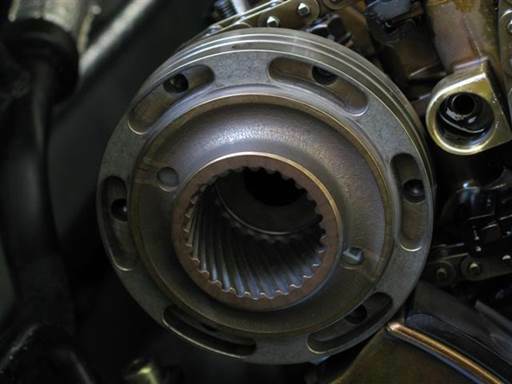 Note: Locking hole exists in the camshaft first bearing cap and camshaft. 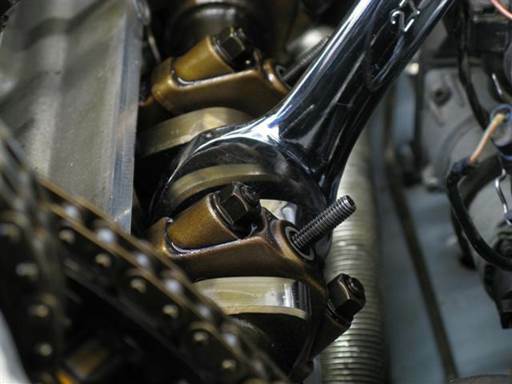 Locking pin is inserted through both holes to lock camshaft. Insert locking pin in camshaft first bearing hole. 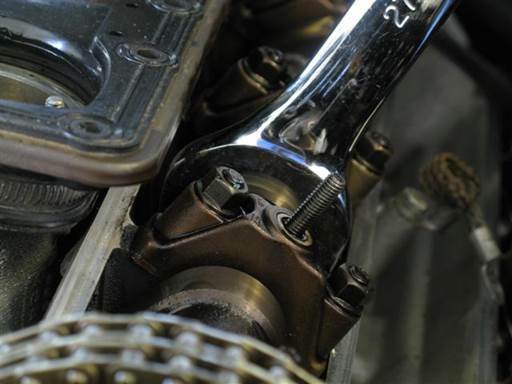 Wiggle camshaft (27mm open wrench) while inserting locking pin through bearing cap locking hole and into camshaft locking hole. Note: Exhaust camshaft access is limited for standard 27mm open wrench. Use short handle adjustable wrench as needed. Fully insert locking pin into bearing cap and camshaft locking holes (picture). Remove bank 1 & 2 vanos mounting bolts. Perform following for each vanos. 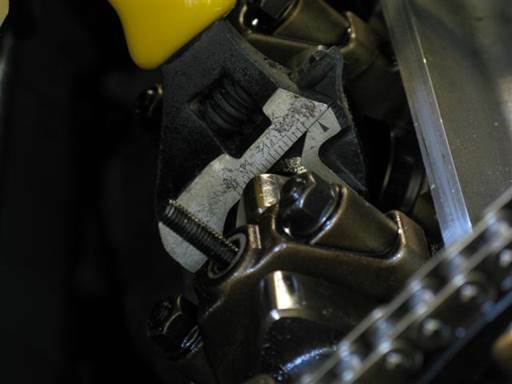 Remove vanos 9 mounting bolts (5mm hex bit socket 3/8” / 3/8” ratchet & extension). Pry bank 1 & 2 vanos from engine head. Perform following for each vanos. 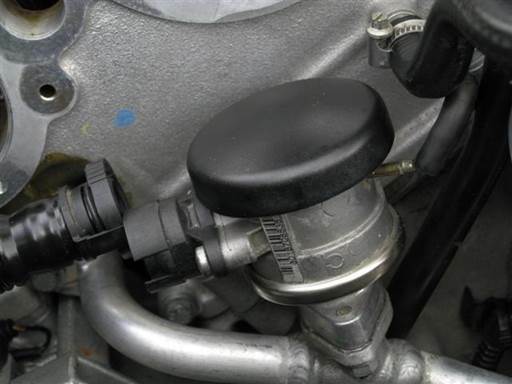 Pry vanos from engine head at intake and exhaust side designated slots (flathead, short flathead). 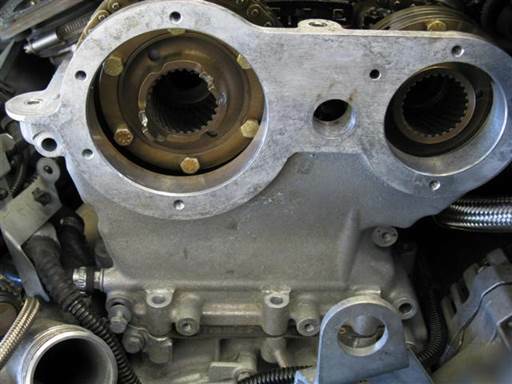 Pry vanos evenly until vanos releases from engine head (vanos seal O-rings disconnect from upper timing cover). Pull bank 1 & 2 vanos forward from engine head. Remove bank 1 & 2 vanos. For each vanos perform following. 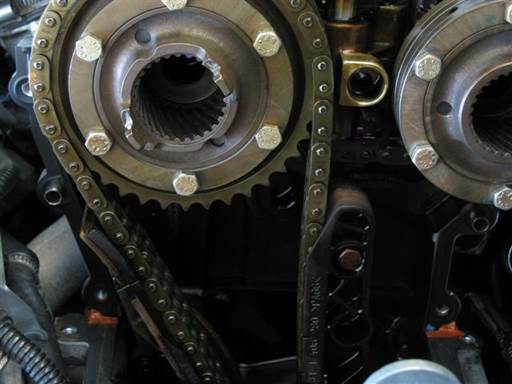 Jerk vanos forward from engine head multiple times to pull splined shafts helical gears from sprocket hubs and release vanos. Take vanos with splined shaft to work bench. 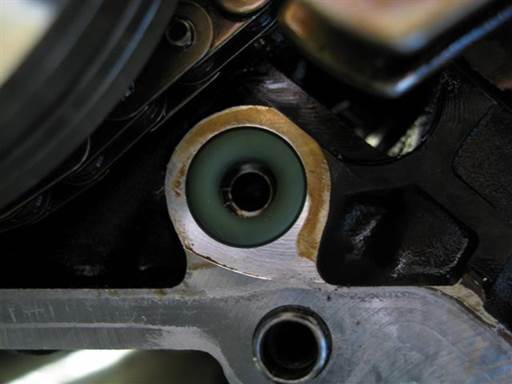 Remove bank 1 & 2 vanos oil input regulator and oil return hole sealing O-rings stuck on upper timing covers. Remove bank 1 & 2 oil input regulator from engine head by prying out regulator at rear (flathead) and pulling out from front. 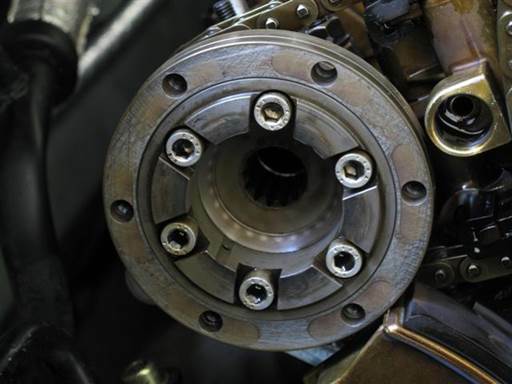 If not replacing sprocket hub diaphragm springs, skip upcoming upper timing cover sections and proceed to removal of splined shafts from vanos section. 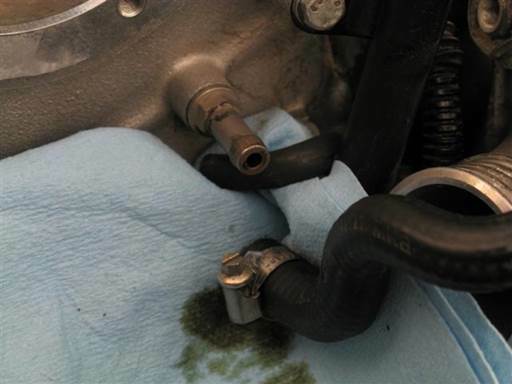 Remove secondary air blower hose and secondary air vacuum control hose from secondary air exhaust valve. Press in blower hose circular locking clip at top and bottom and pull off hose. Place blower hose to side. Remove secondary air pipe left end mounting bolt (10mm socket 3/8” / 3/8” ratchet & extension). Remove secondary air pipe right end mounting bolt (10mm socket 3/8” / 3/8” ratchet & extension). Remove secondary air pipe center mounting bolt (10mm socket 3/8” / 3/8” ratchet & extension). 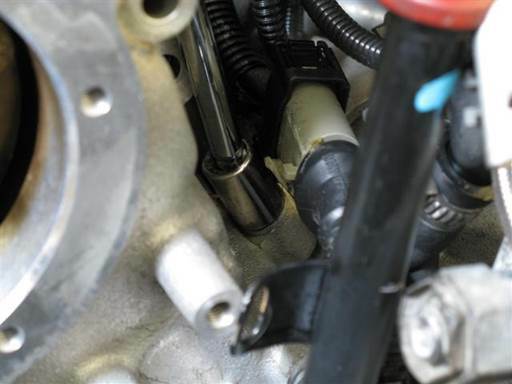 Pull secondary air pipe right and left ends out of engine and remove pipe from engine compartment. 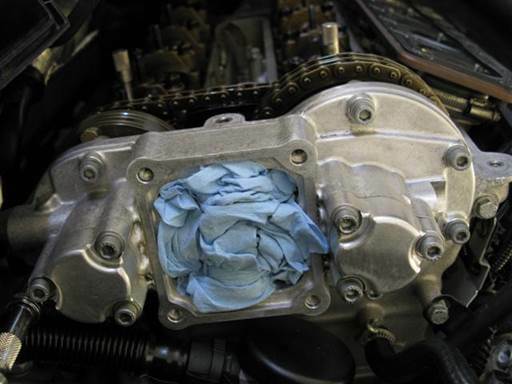 Remove vanos oil pressure overflow hose from bank 1 timing cover. Loosen hose mounting clamp (5mm socket 1/4” / 1/4" ratchet & extension). Place folded towel under hose end. Pull hose from cover pipe and catch draining oil from hose. Note: Moderate amount of oil will drain from hose. 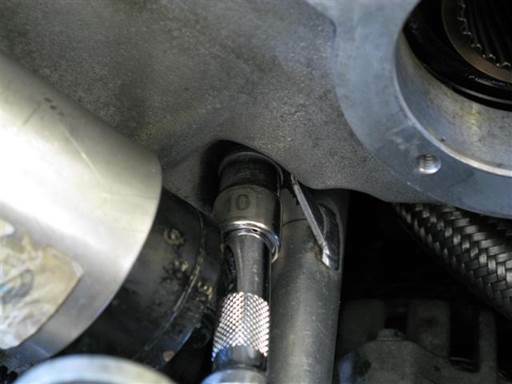 Remove oil dip-stick pipe mounting bolt (10mm socket 3/8” / 3/8” ratchet & extension). 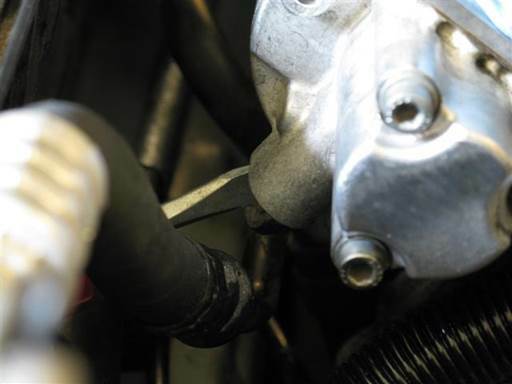 Remove cable from cable clip on bank 2 under vanos oil accumulator. Open clip and remove cable. 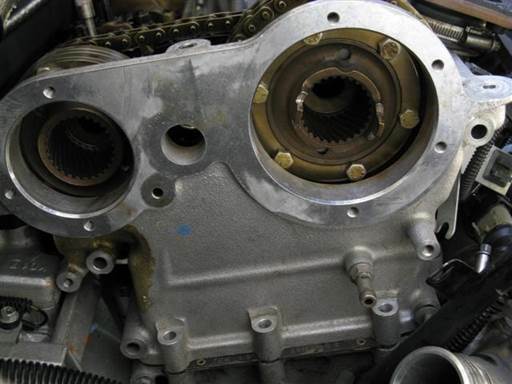 Remove vanos oil accumulator with mounting bracket form bank 2 timing cover. Remove oil accumulator bracket right and left mounting bolts (10mm socket 3/8” / 3/8” ratchet & extension, 10mm ratcheting wrench). Note: Accumulator bracket middle bolt mounts bracket onto accumulator and does not need to be removed. Pull up accumulator with bracket and set at top of engine. Note: Maintain accumulator hose on accumulator. 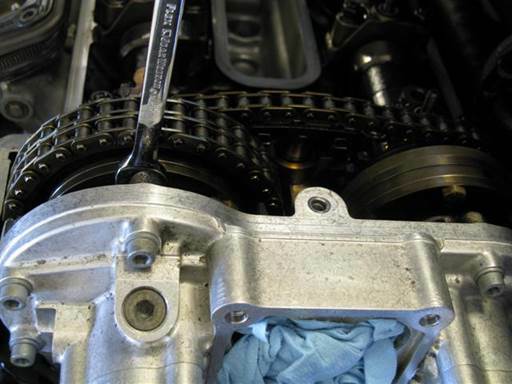 Remove crankshaft chain tensioner at side of bank 1 upper timing cover. 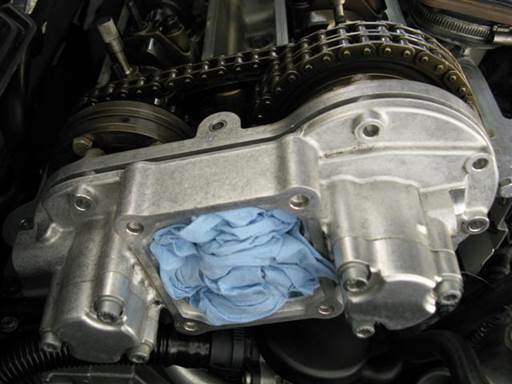 Place folded towel under tensioner to catch draining oil (towels). 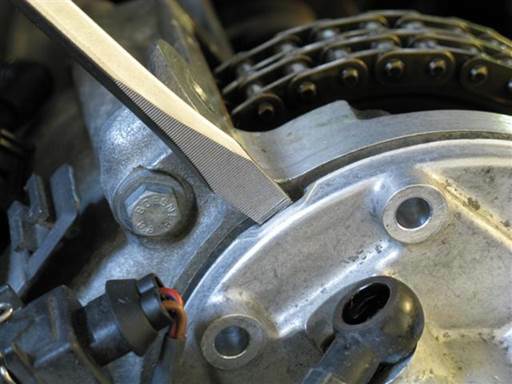 Remove chain tensioner (19mm deep socket 3/8” / 3/8” long-arm ratchet). 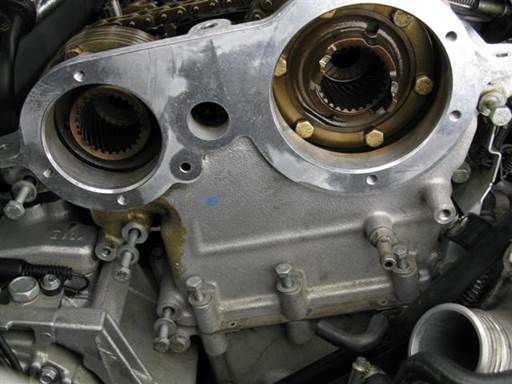 Remove bank 1 & 2 upper timing cover side and bottom mounting bolts. For each timing cover perform following. Remove timing cover left at right side 3 (each) mounting bolts (10mm socket 3/8” / 3/8” ratchet & extension, 10mm ratcheting wrench). 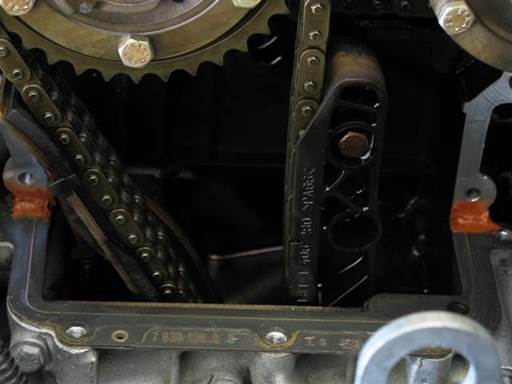 Note: Intake side lower bolt requires low profile tool (10mm ratcheting wrench), and cannot be removed form timing cover due to access restriction. It is removed with timing cover. Remove timing cover bottom 3 mounting bolts (10mm socket 1/4" / 1/4" ratchet & wobble extension). 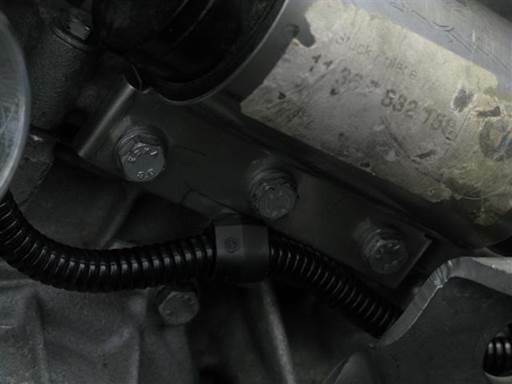 Note: Intake side bolt does not have direct access and requires wobble socket extension or equivalent tool. Remove bank 1 & 2 timing cover intake side rear mounting bolt. For each timing cover perform following. Remove timing cover intake side rear mounting bolt (10mm socket 1/4" / 1/4" ratchet & long wobble extension, 10mm ratcheting wrench). Note: Bank 1 bolt does not have direct access and requires wobble socket extension or equivalent tool. Remove bank 1 timing cover exhaust side rear mounting bolt. Initially loosen bolt (10mm socket 1/4" / 1/4" long-arm small head ratchet). Note: Access is limited and ratchet and socket need to be low profile. Unthread bolt by pressing against head hex edges (small flathead). 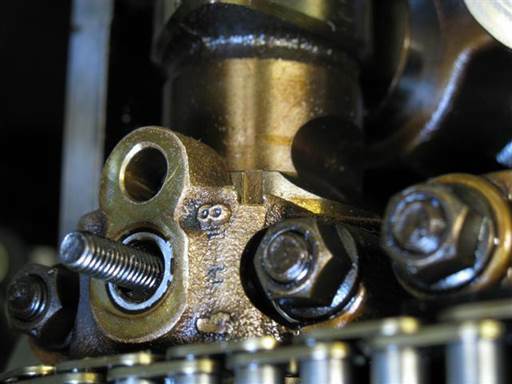 Once bolt head bottom is accessible, unthread bolt by pressing against head bottom (small flathead). 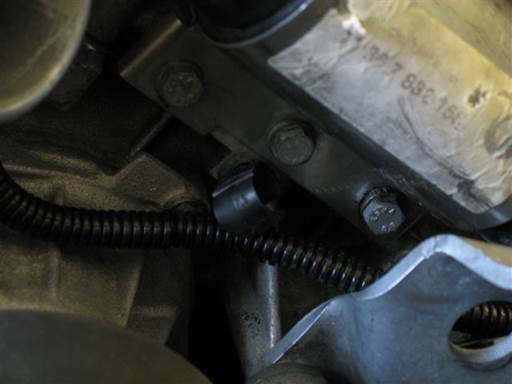 Note: Removal of bolt is difficult due to very limited access and requires time and patience to remove. Remove bank 2 timing cover exhaust side rear mounting bolt (10mm ratcheting wrench). Remove bank 1 & 2 upper timing cover. For each timing cover perform following. 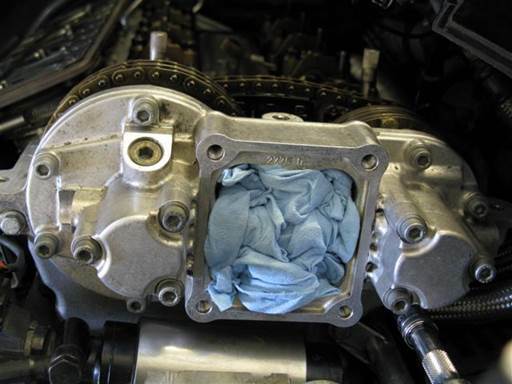 Pull forward and remove timing cover. 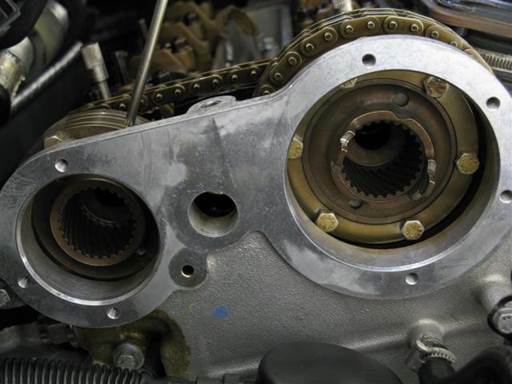 Remove right and left side gaskets. 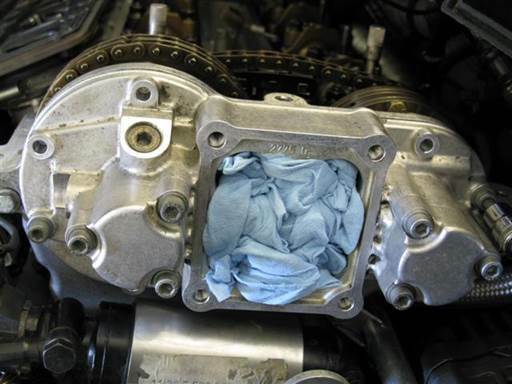 Be careful to not allow gaskets to drop in engine. Caution: Do not attempt to remove bottom gasket. This is head gasket and is under engine head and cannot be removed. 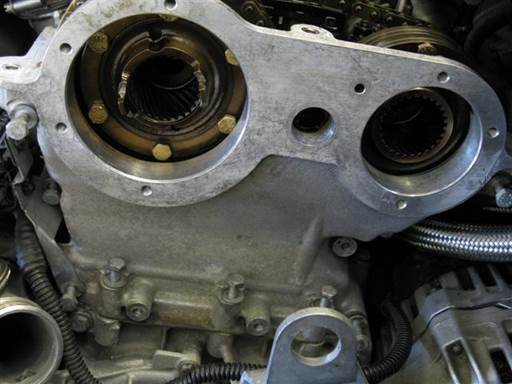 Note: Intake side bottom bolt is removed with timing cover. Note: Bank 2 bottom left hose is removed with timing cover. Cover up bank 1 & 2 crankshaft chain access slot. For each chain slot perform following. Lay towel over chain slot (towels). Note: Towel will prevent components from dropping in chain slot during following repair steps. Remove bank 1 intake sprocket hub 6 mounting bolts (10mm socket 3/8” / 3/8” ratchet & extension). Note: Bolts had previously been loosened. Pull forward and remove bank 1 intake sprocket hub. Note: Hub has diaphragm spring and pressure plate at its rear center. Remove these parts with hub. Remove bank 1 exhaust sprocket hub 6 mounting bolts (10mm socket 3/8” / 3/8” ratchet & extension). Pull forward and remove bank 1 exhaust sprocket hub. Remove bank 1 exhaust sprocket hub rear plate sill mounted on camshaft. Remove bank 2 intake sprocket hub 6 mounting bolts (10mm socket 3/8” / 3/8” ratchet & extension). Pull forward and remove bank 2 intake sprocket hub. Remove bank 2 exhaust sprocket hub 6 mounting bolts (10mm socket 3/8” / 3/8” ratchet & extension). Pull forward and remove bank 2 exhaust sprocket hub. Remove bank 2 exhaust sprocket hub rear plate sill mounted on camshaft. 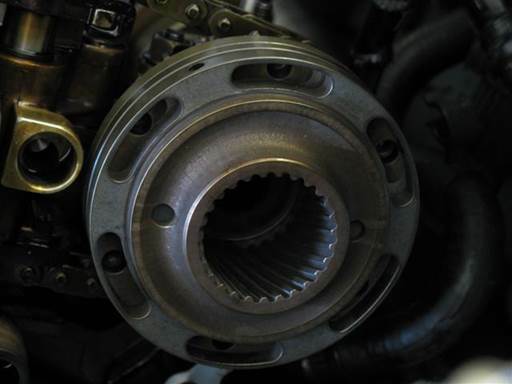 Maintain bank 1 & 2 intake and exhaust sprocket hub components separate from each other so parts are not mixed. 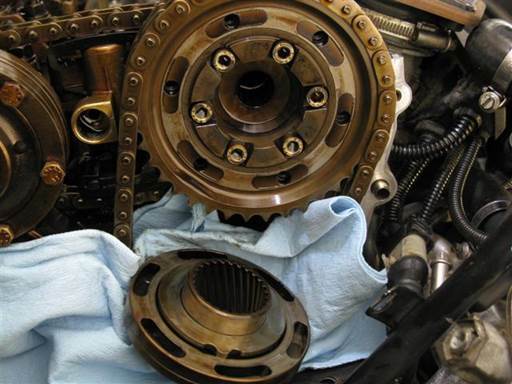 Remove and discard sprocket hubs diaphragm springs and pressure plates. Separate plate at each hub front from hub. Hit plate from rear of hub through slots at multiple locations to dislodge plate form hub. Spray clean sprocket hub components (brake cleaner & towels). Note: Be sure to clean slots and bolt holes. Clean sprocket hubs mounting bolts (brake cleaner & towels). 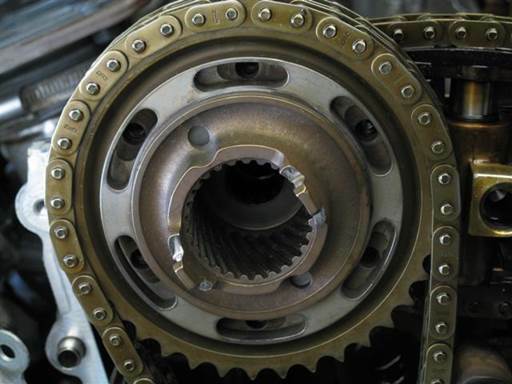 Clean sprockets at engine (brake cleaner & towels). Be sure to clean bolt holes. 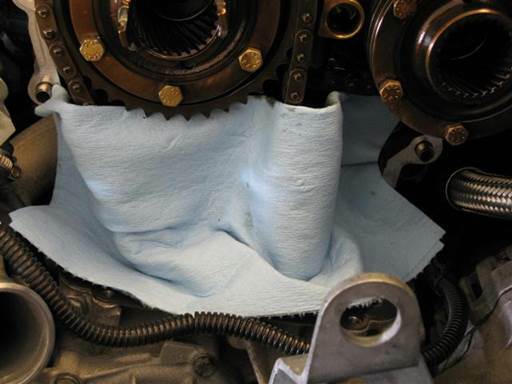 Clean upper timing cover matting surfaces at engine (brake cleaner & towels). 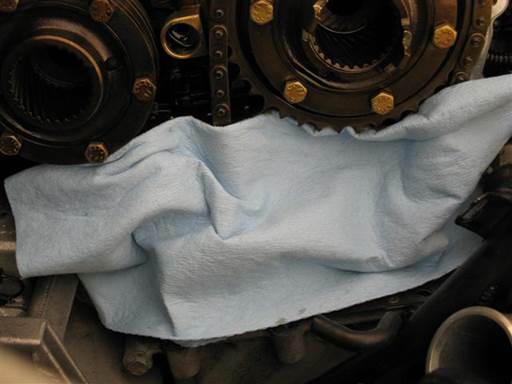 Clean upper timing covers outside and matting surfaces (brake cleaner & towels). 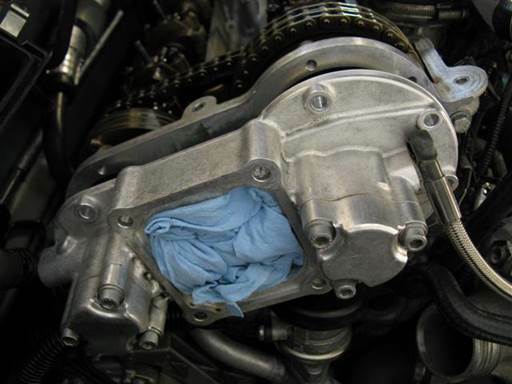 Clean timing cover mounting bolts (brake cleaner & towels). 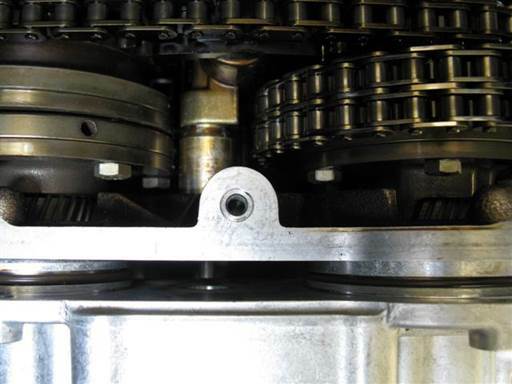 For each bank sprocket hubs perform following diaphragm spring and pressure plate installation. Install new diaphragm spring, cup side down, into each sprocket hub. Install new pressure plate into each sprocket hub. Align pressure plate and hub keys. Warning: Do not mix combine old and new diaphragm spring and pressure plate parts as dimensions have been changed. 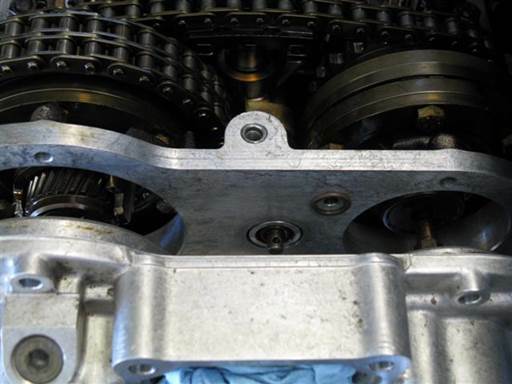 Perform above sprocket hub diaphragm spring and pressure plate installation procedure for second bank sprocket hubs. Install intake hub on sprocket. Align hub on sprocket with hub protruding front tabs approximately horizontal with floor. Align hub on sprocket with sprocket bolt holes at middle of hub slots. Install intake hub plate on hub front and mount with one bolt. Fully mate plate on hub and align plate bolt hole with sprocket bolt hole. Install one bolt at a top hole. Tighten bolt until initial resistance (hand). Install intake hub remaining 5 mounting bolts. Tighten bolts until initial resistance (hand). Install exhaust hub rear plate. Note: Rear plate can be distinguished from front plate by its shinny rear side. Front and rear plates are same part. Alight plate bolt hole with sprocket bolt hole. 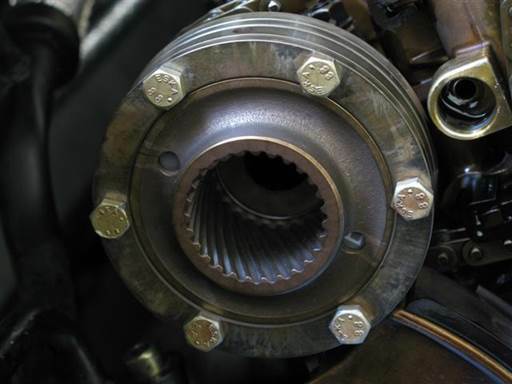 Install exhaust hub onto sprocket. Align hub on sprocket with one of two side holes at top (picture). Note: Hub side holes are on opposite sides of hub. Note: Hub will not fully mate with rear plate due to diaphragm spring. Install exhaust hub plate on hub front and mount with one bolt. Install exhaust hub remaining 5 mounting bolts. Install intake hub onto sprocket. Remove bank 1 crankshaft chain tensioner rubber grommet below exhaust sprocket. Pry out grommet (90 degree pick tool). Install bank 1 crankshaft chain tensioner new rubber grommet. Clean grommet mounting hole (brake cleaner & towels). Fully press in new grommet into mounting hole (fingers). Bank 1 upper timing cover has one special bolt. Bolt is slightly shorter than long bolts. This bolt should be identified and separated so it can be definitively located during following upper timing cover installation. Verify upper timing cover outside and matting surfaces are clean (brake cleaner & towels). Note: Bank 2 oil drain hose is maintained on cover. 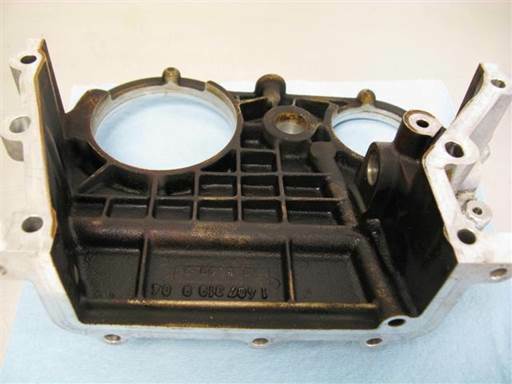 Apply gasket sealant at bank 1 & 2 head upper timing cover bottom rear corner. For each bank perform following. Place thin coat of gasket sealant at head upper timing cover bottom rear corners. Allow sealant to solidify for 2 minutes before mounting timing cover. 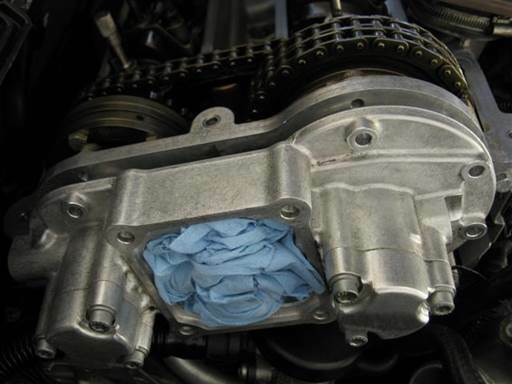 Install bank 1 & 2 upper timing cover gaskets. For each bank perform following. 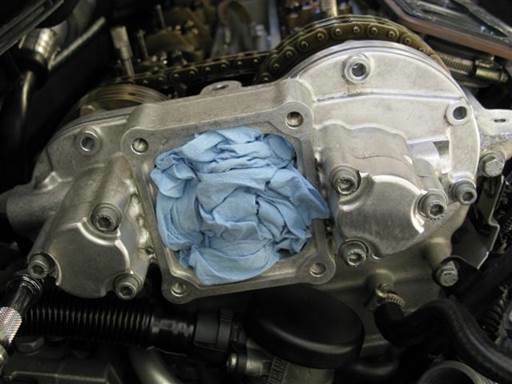 Install cover gasket at engine head right and left upper timing cover matting surfaces. 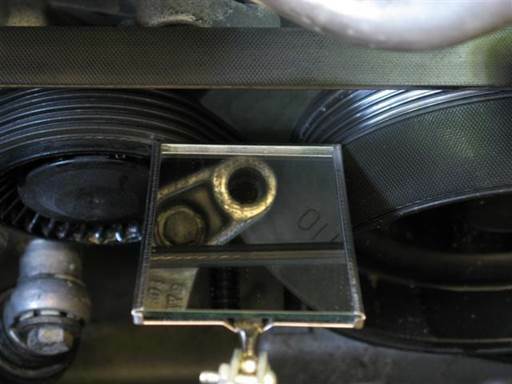 Orient gasket to engine head shape and install gasket onto head matting dowel. Note: Bank 1 & 2 gaskets are same parts. Note: Gasket end with longer extension past bolt hole is oriented to top. Mount bank 1 & 2 upper timing covers to engine heads. For each upper timing cover perform following. Install cover intake side lower mounting bolt (long) onto cover before installing cover onto engine head. Note: Cover intake side lower mounting bolt must be installed on cover before mounting cover due to access restriction. Install cover on engine head, matting intake side to engine head then exhaust side. Install bank 1 & 2 upper timing cover mounting bolts. Perform following for each upper timing cover. Install cover 4 long mounting bolts at cover front right and left top and bottom mounting holes (10mm socket 3/8” / 3/8” ratchet & extension). Note: Intake side bottom bolt already installed. Install cover 2 short mounting bolts at cover front right and left middle (10mm socket 3/8” / 3/8” ratchet & extension). 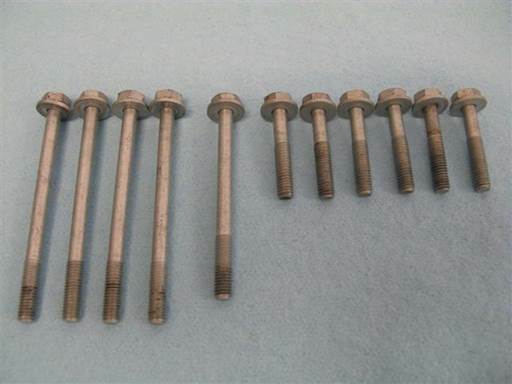 Note: Bank 1 front left middle bolt is not short bolt, but is special slightly short of long bolt. Install cover 3 short mounting bolts at cover front bottom (10mm socket 1/4" / 1/4" ratchet & long wobble extension). Initially install bolts until snug. Install bank 1 & 2 upper timing cover intake side rear mounting bolt. For each timing cover perform following. Install timing cover intake side rear short mounting bolt (10mm socket 1/4" / 1/4" ratchet & long wobble extension, 10mm ratcheting wrench). Install bank 1 upper timing cover exhaust side rear short mounting bolt. 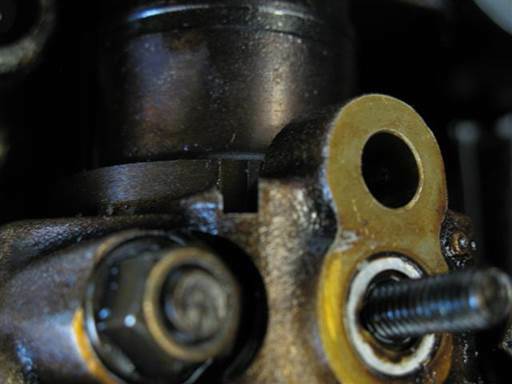 Note: Bolt access is extremely limited and great patience and time is needed to mount bolt. 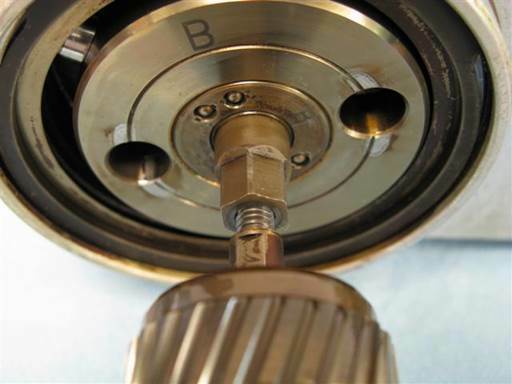 Thread bolt by pressing against head hex edges and rotating at top (small flathead). Once bolt is mostly threaded, bolt can be accessed with low profile ratcheting tools (10mm socket 1/4" / 1/4" long-arm ratchet). Initially install bolt until snug. Install bank 2 upper timing cover exhaust side rear short mounting bolt (10mm ratcheting wrench). Fully tighten bank 1 & 2 upper timing cover mounting bolts, 10 Nm (7 ft-lb). Tighten bolts evenly in multiple passes. Verify one pass with all bolts fully tightened. 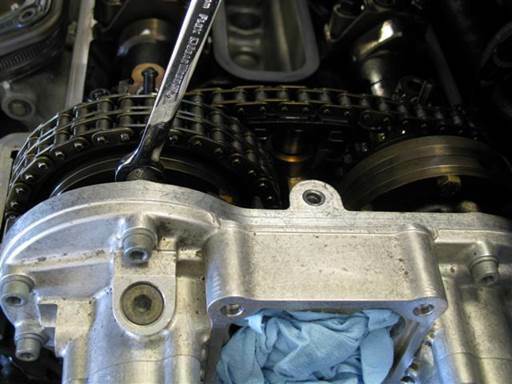 Separate crankshaft chain tensioner parts and drain oil from tensioner. Reassemble tensioner parts. Note parts assembly orientation (picture). 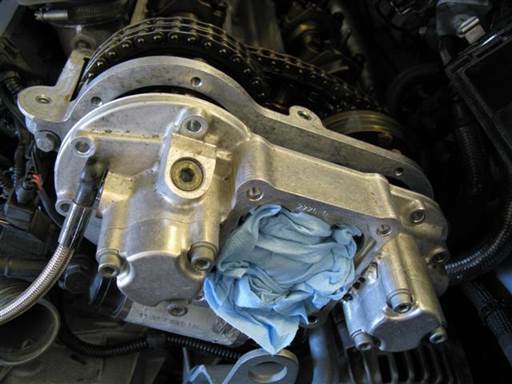 Note: Draining of oil from tensioner allows needed compression of tensioner for installation. 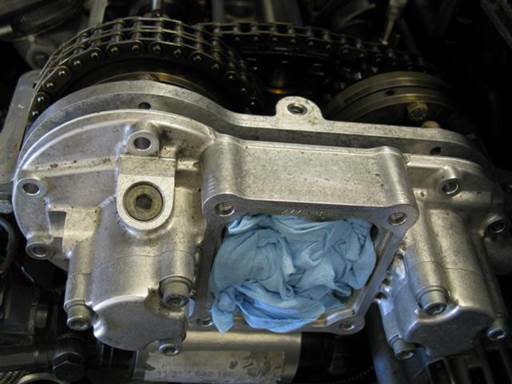 Install crankshaft tensioner at bank 1 upper timing cover. Install new crush washer on tensioner mounting cap and insert tensioner in mounting cap. 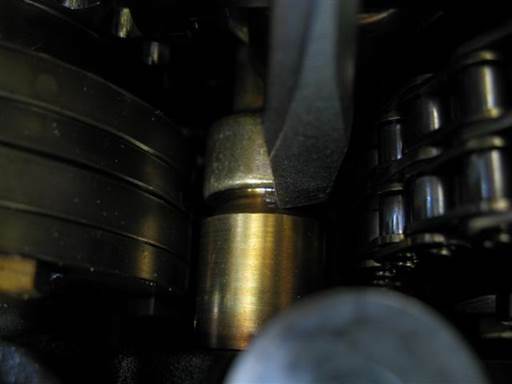 Note tensioner orientation in cap (picture). Install tensioner at bank 1 upper timing cover exhaust side (19mm deep socket 3/8” / 3/8” long-arm ratchet). Fully tighten chain tensioner, 40 Nm (29.5 ft-lb) (19mm deep socket 3/8” / 3/8” torque wrench). Install vanos oil accumulator with mounting bracket on bank 2 timing cover. Install oil accumulator bracket right and left mounting bolts (10mm socket 3/8” / 3/8” ratchet & extension, 10mm ratcheting wrench). Initially align and install bolts two rotations (hand), then fully mount bolts. Install cable in cable clip at bank 2 under oil accumulator. 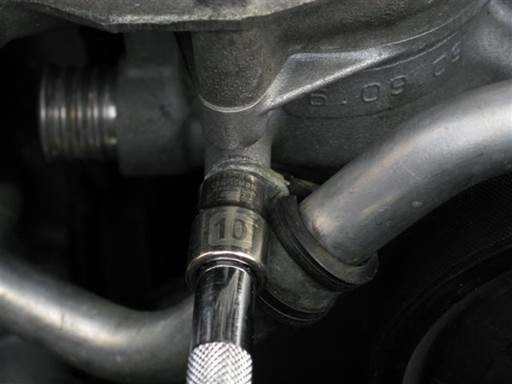 Install oil dip-stick pipe mounting bolt (10mm socket 3/8” / 3/8” ratchet & extension). Note: Bolt can be seen in next picture. 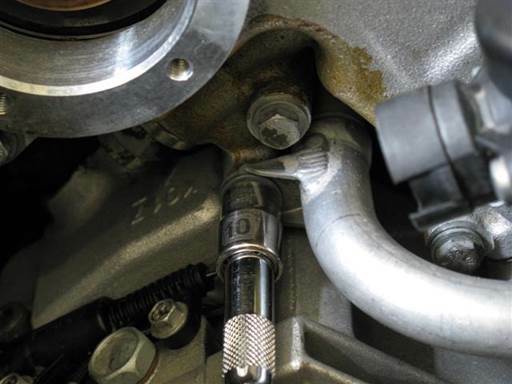 Install vanos oil pressure overflow hose on bank 1 upper timing cover. Orient hose clamp with bolt to top (picture). Press hose fully onto mounting pipe. Position hose clamp over mounting position and tighten (5mm socket 1/4” / 1/4" ratchet & extension). Remove secondary air pipe 2 pipe end O-rings. For each pipe end perform following. Cut and remove O-ring (razor knife). Note: Rocking of blade while pressing helps create cutting motion. Clean secondary air pipe end O-ring grooves (brake cleaner & towels). Install secondary air pipe 2 pipe end O-rings. For each pipe end perform following. Insert new O-ring in pipe groove at one end and stretch other end over pipe and drop into groove (hands/fingers). 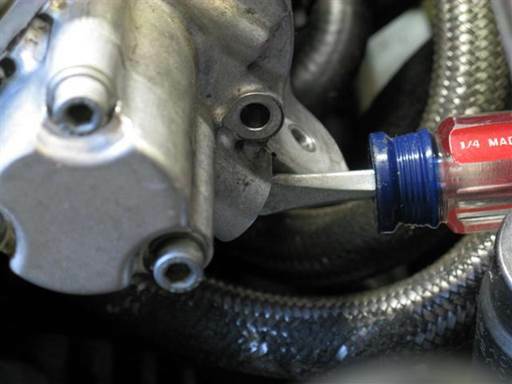 Lightly lubricate O-ring to ease pipe installation (assembly oil). Install secondary air pipe onto engine and insert right and left ends into engine mount holes (see next two pictures). Align pipe right and left mounting bracket holes with timing cover mount holes. Press pipe right and left ends into timing covers until they snap into place. Install secondary air pipe left end mounting bolt (10mm socket 3/8” / 3/8” ratchet & extension). Note: Bolt has washer and unthreaded end. Install secondary air pipe right end mounting bolt (10mm socket 3/8” / 3/8” ratchet & extension). Install secondary air pipe center mounting bolt (10mm socket 3/8” / 3/8” ratchet & extension). If hole alignment difficult, loosen pipe end mounting bolts, install center mounting bolt, then retighten pipe end mounting bolts. 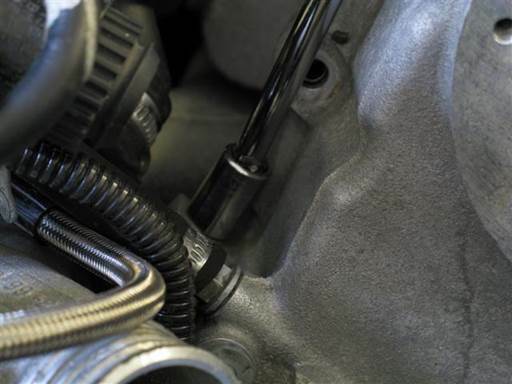 Install secondary air blower hose and secondary air vacuum control hose onto secondary air exhaust valve. Press blower hose onto valve connector until hose clips snap into place. Press vacuum hose onto valve hose pipe. 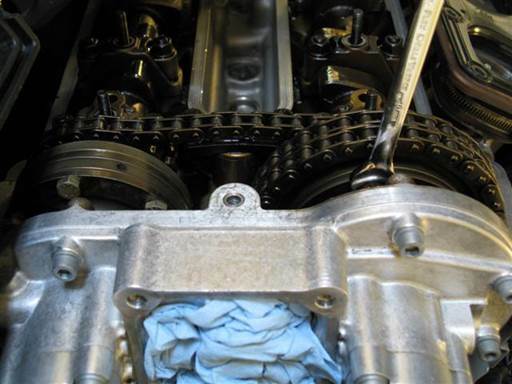 For each vanos perform following splined shafts removal. 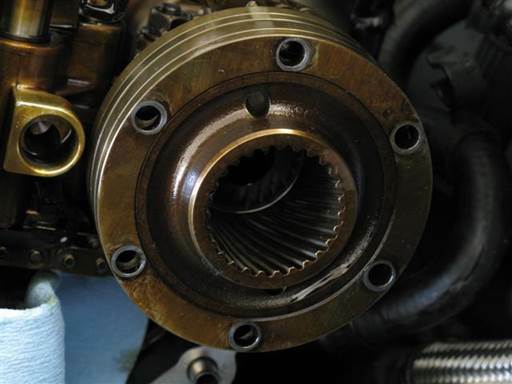 Remove vanos intake splined shaft from intake piston. Counter hold splined shaft stud and unscrew vanos intake piston; left hand thread (7mm open wrench, 10mm open wrench). Note: Piston and shaft stud are left hand thread, thus unscrew by turning piston tool (10mm open wrench) from right to left (above picture orientation). 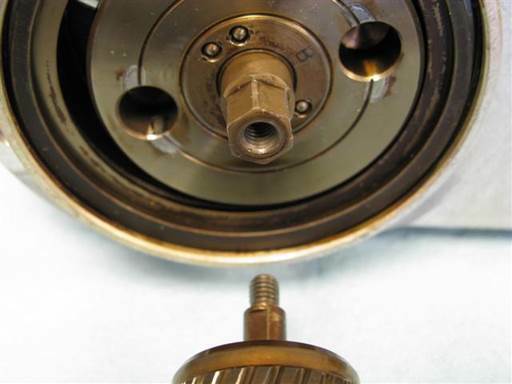 Once mount is loosened, rotate splined shaft stud clockwise (above picture orientation) to unscrew from piston (fingers). 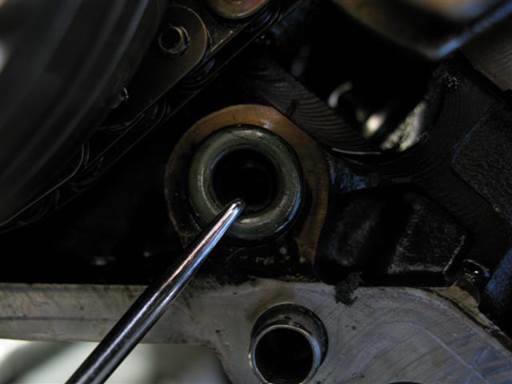 Remove vanos exhaust splined shaft from exhaust piston. Counter hold splined shaft stud and unscrew vanos exhaust piston; left hand thread (7mm open wrench, 10mm open wrench). 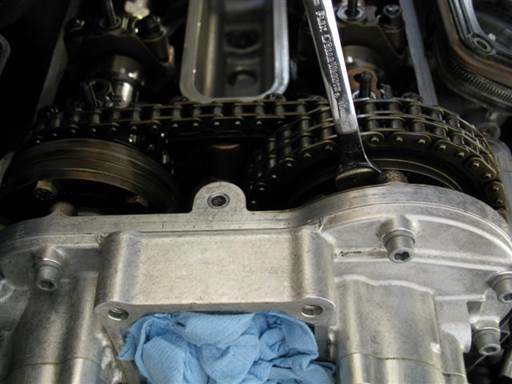 Repeat above splined shaft removal procedure for second vanos. Note: 4 splined shafts are same part and can be interchanged. Following procedure applies to all splined shafts. Splined shafts are same part. Perform following for each splined shaft. 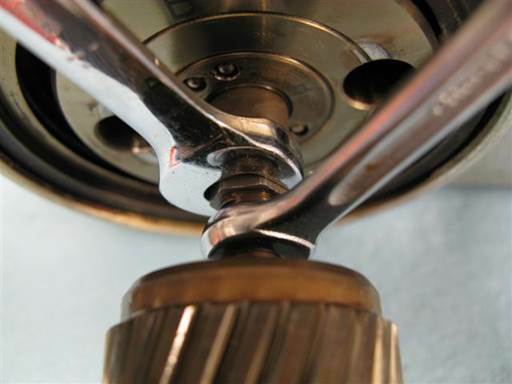 Clean splined shaft (brake cleaner & towels). 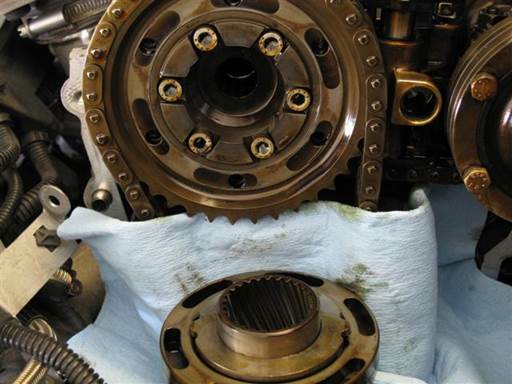 Spray then drain cleaner through splined shaft cover holes to clear oil from bearing (brake cleaner). 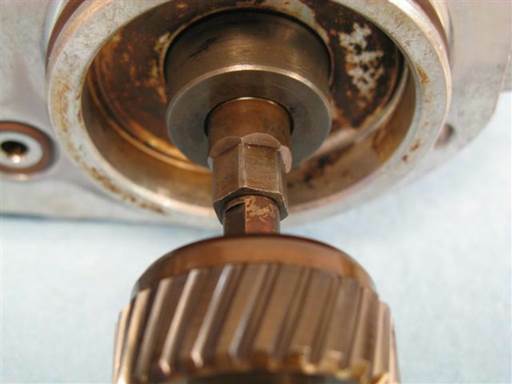 Note: Removing oil from splined shaft bearing allows for bearing fit assessment in next step. 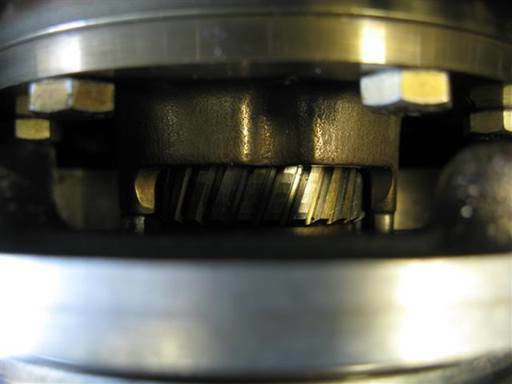 Inspect splined shaft bearing axial play. Hold splined shaft and tilt (rock) splined shaft stud to each side to note bearing axial play (free space). Axial play can also be checked by repeated insertion and withdrawal of stud in/out of splined shaft. Note: Radial play, side to side movement, is normal and necessary. This should not be confused with axial play, in/out movement. Open vise jaws as far as necessary to insert splined shaft holder. Insert splined shaft holder in vise and align top to vise jaw top. Strongly tighten vise on splined shaft holder. 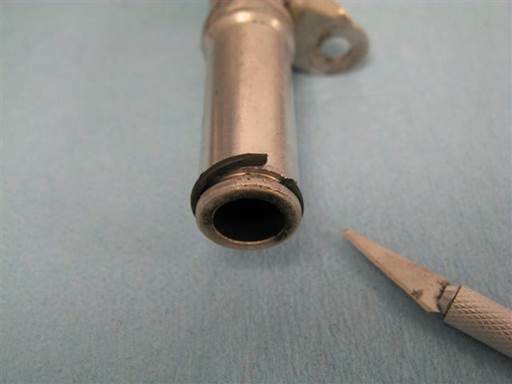 Insert splined shaft in splined shaft holder. Install splined shaft socket on splined shaft and insert socket pins into splined shaft cover holes. Note: Socket pins will fit tightly in splined shaft cover holes and rocking of socket might be needed to fully insert pins into holes. 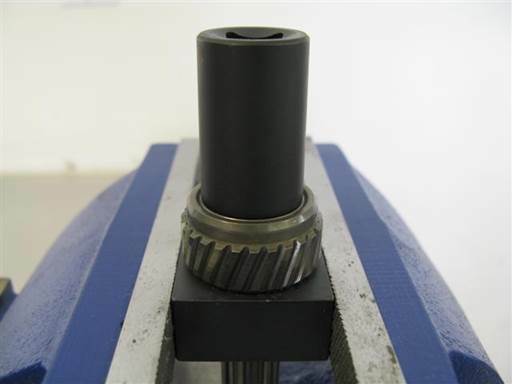 Verify socket pins are fully inserted in splined shaft cover holes and socket is fully seated on splined shaft cover. Loosen (break seize) splined shaft cover (splined shaft socket / 1/2” impact wrench). 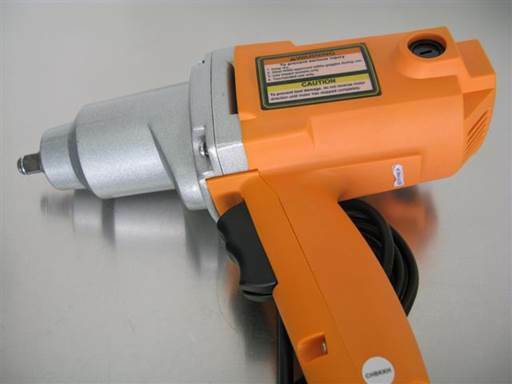 If available, set impact wrench power to lowest setting. 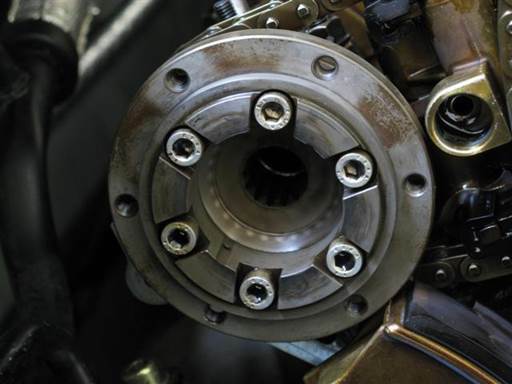 Engage impact wrench in reverse for 3 second intervals at a time until cover loosens (seize breaks). Note: Hold down impact wrench for control. Remove splined shaft cover (splined shaft socket / 1/2” ratchet). Note: Splined shaft cover will turn with difficulty due to thread locker. Bearing top washer will likely be bound to splined shaft cover and come out with cover. 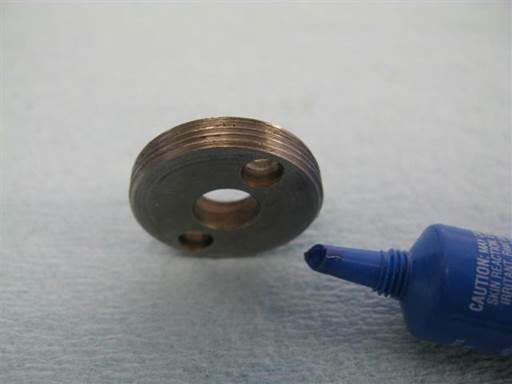 Remove splined shaft center washer / stud (hand). Note: Splined shaft stud is integral with bearing center washer. 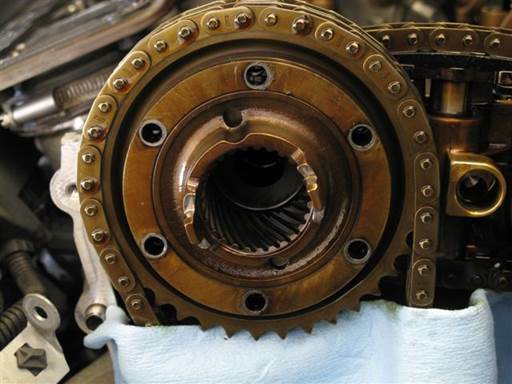 Bearing top thrust (roller) bearing will come out with stud and center washer. 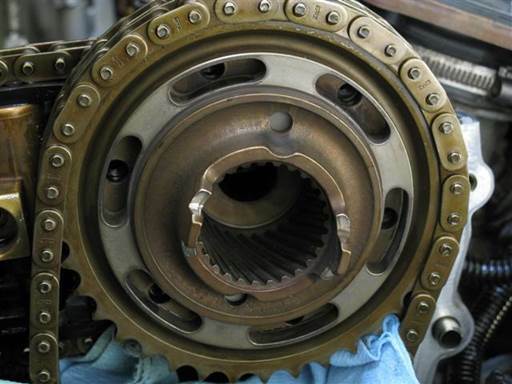 Remove bearing bottom thrust (roller) bearing. 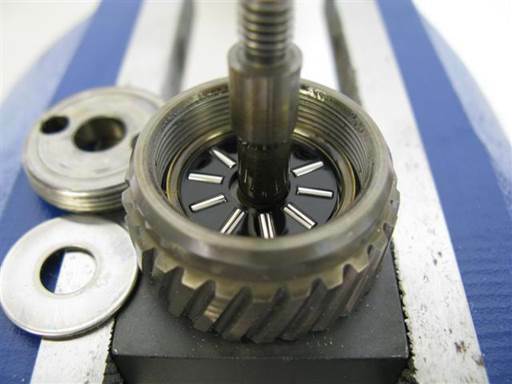 Insert pick tip between thrust bearing inner bottom and bottom washer and pry thrust bearing out (90 degree pick). Place towel on table. Remove splined shaft from holder, tilt upside down, and hit on towel on table. 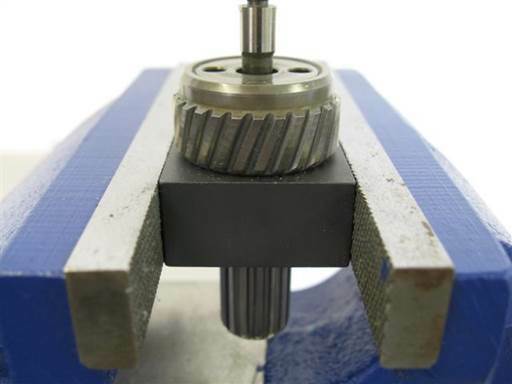 Bearing ring will dislodge in splined shaft. Remove bearing ring with index finger. If bearing ring tilts and binds in splined shaft, press ring down in splined shaft to remount, then reattempt removal. Reinstall splined shaft in splined shaft holder. Insert pick tip between washer inner bottom and splined shaft and pry washer out (90 degree pick). Clean bearing parts (brake cleaner & towels). Note: It is important bearing parts are thoroughly cleaned. This is needed to properly assess new bearing axial fit. Remove old thread locker on cover and housing thread. Use pick tool to press tip into thread valley and run pick throughout thread (90 degree pick). 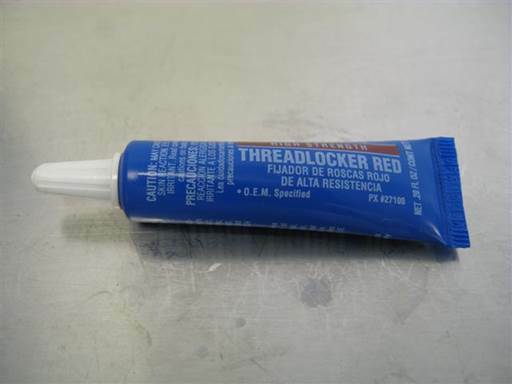 Note: It is critical old thread locker be fully removed to allow new thread locker to bond with parts. 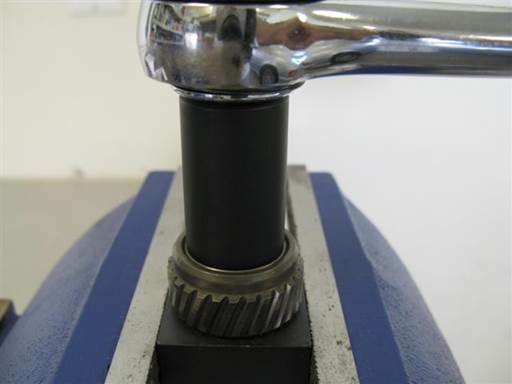 Clean splined shaft bearing cavity and cover (brake cleaner & towels). 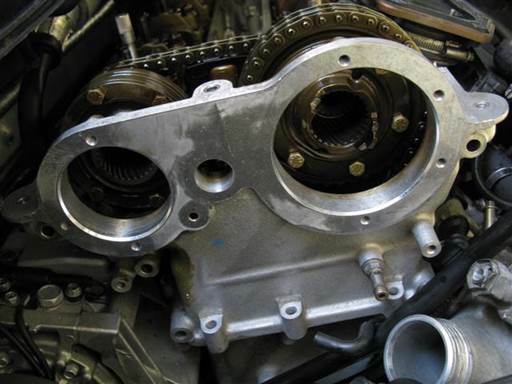 Replace bearing ring and top and bottom washers with new parts. Bearing parts installation sequence from right to left. 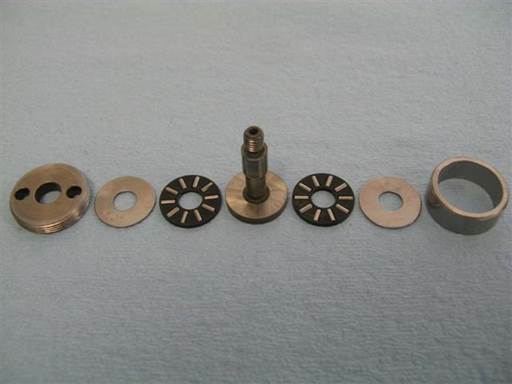 Bearing parts from left to right: Cover, top washer, top thrust bearing, center washer / stud, bottom thrust bearing, bottom washer, bearing ring. Insert new bearing ring in splined shaft (fingers). Note: New ring is marked “BS” on outer perimeter. 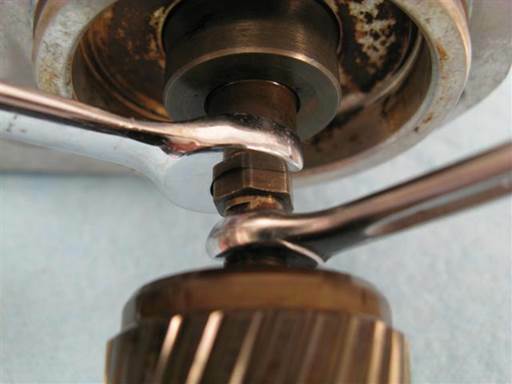 Initially insert ring in splined shaft. Insert right and left index fingers into ring. Press fingers against ring inner right and left walls and manipulate ring side to side while slightly pressing down to facilitate ring full insertion. Rotate position of fingers 90 degrees and repeat ring insertion to verify full insertion. 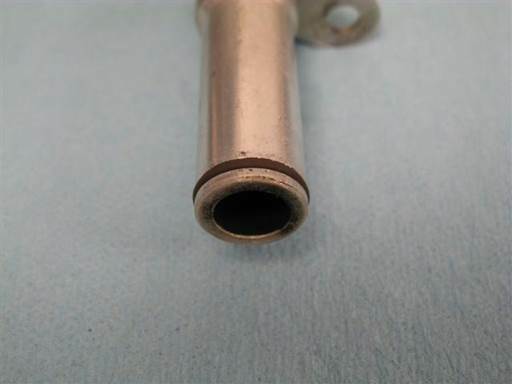 Note: Ring should fully mate with splined shaft bottom (picture). Insert bearing bottom washer in splined shaft bearing ring. 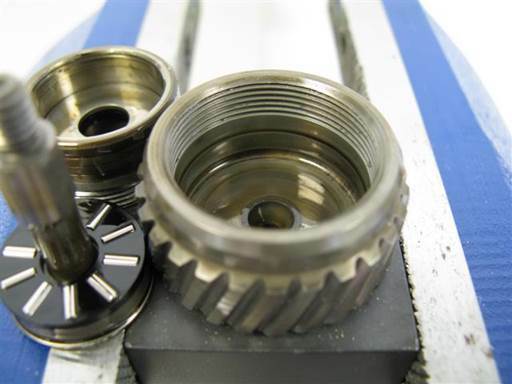 Note: Splined shaft bearing top and bottom washers are interchangeable. Also washer faces are same thus washer can be inserted in either orientation. Insert bearing bottom thrust (roller) bearing in splined shaft bearing ring. 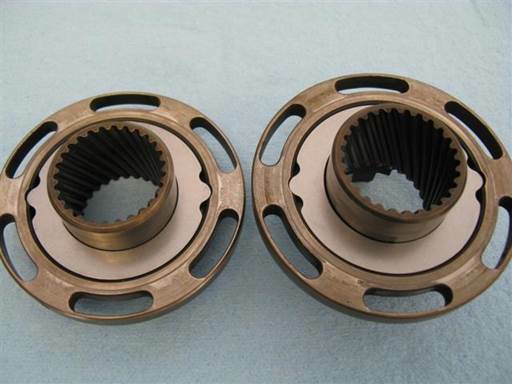 Note: Splined shaft bearing top and bottom thrust bearings are interchangeable. 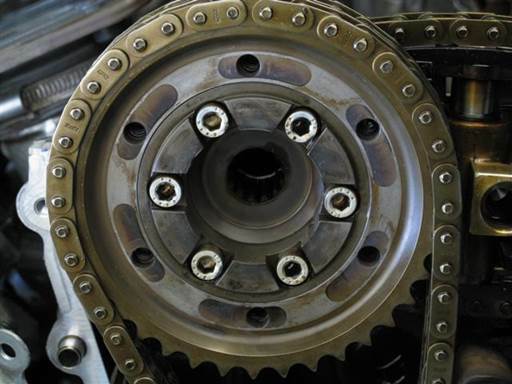 Also thrust bearing faces are functionally same thus thrust bearing can be inserted in either orientation. Insert bearing center washer / stud in splined shaft bearing ring. 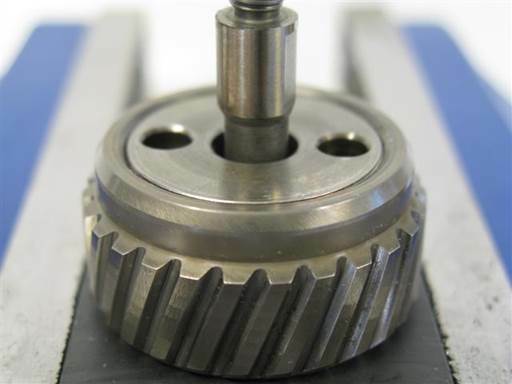 Insert bearing top thrust (roller) bearing onto splined shaft stud and in splined shaft bearing ring. 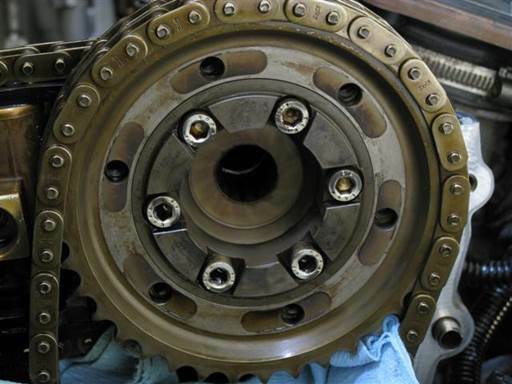 Note: Thrust bearing faces are functionally same thus thrust bearing can be inserted in either orientation. Insert bearing top washer onto splined shaft stud and in splined shaft bearing ring. Note: Washer faces are same thus washer can be inserted in either orientation. Install splined shaft cover onto splined shaft (splined shaft socket / 1/2” ratchet). 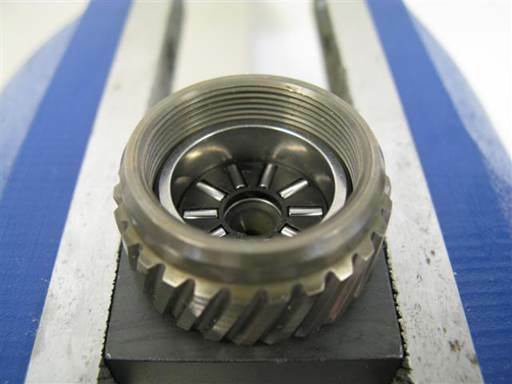 When splined shaft cover is fully installed its top will be even with splined shaft rim (picture). 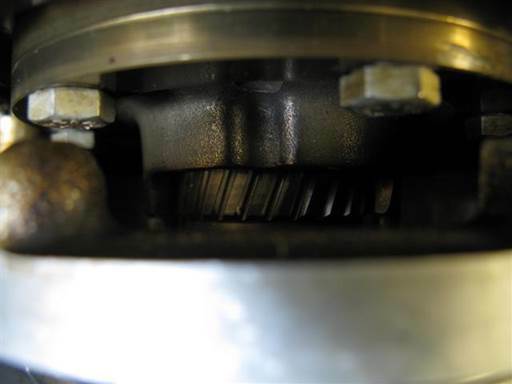 If cover is higher than splined shaft rim then bearing parts are not installed correctly and interfering with cover installation. 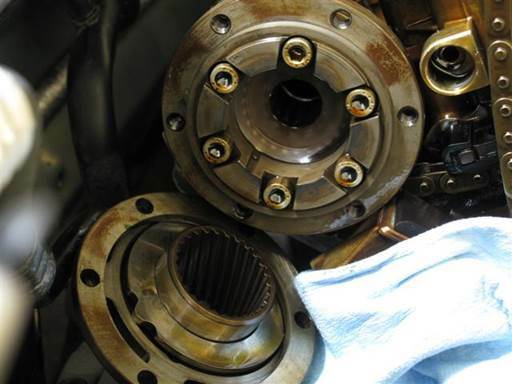 Remove cover and reinstall bearing parts. Fully tighten splined shaft cover, 55 Nm (40.5 ft-lb) (splined shaft socket / 3/8” torque wrench & 3/8” to 1/2" socket adapter). Hold splined shaft and rotate splined shaft stud to note resistance to rotation. 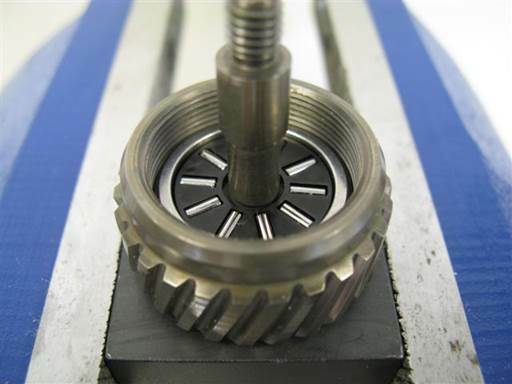 Note: Axial fit cannot be properly assessed until splined shaft cover is fully tightened. If splined shaft stud binds and is difficult to rotate then axial fit is too tight and loosening adjustment is needed. If splined shaft stud has any tilt movement then axial play is present and tightening adjustment is needed. Any level of resistance (pre-load), without binding, in splined shaft stud rotation indicates no axial play and is considered an optimal fit. 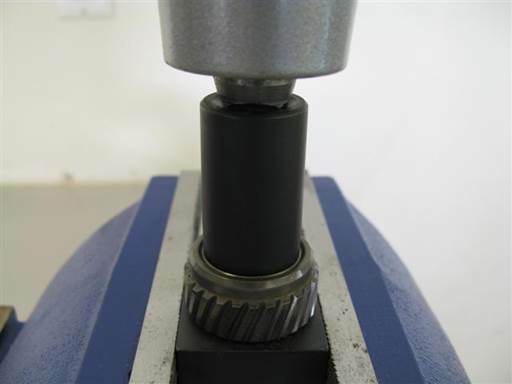 If splined shaft binds and is difficult to rotate then axial fit it too tight and loosening adjustment is needed. 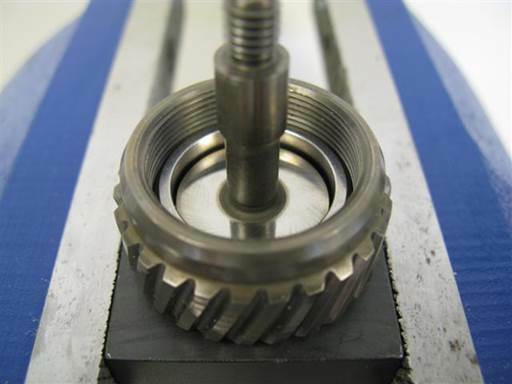 Disassemble splined shaft bearing per above procedure. Place sandpaper (300-400 grit) on flat table top. 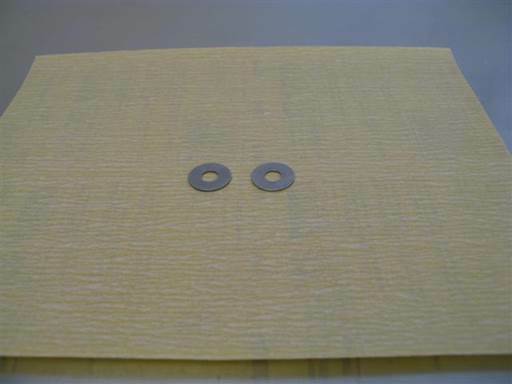 Place bearing outer washer on sandpaper. Slide washer side to side on sandpaper ~6” back and forth while moderately pressing washer on sandpaper. Perform sanding for 10 seconds. Rotate washer 90 degrees and repeat sanding process. Flip washer to opposite side and repeat above sanding procedure; 10 seconds sanding, rotate 90 degrees, 10 seconds sanding. Clean washer (brake cleaner & towels). Repeat washer sanding for second outer washer. 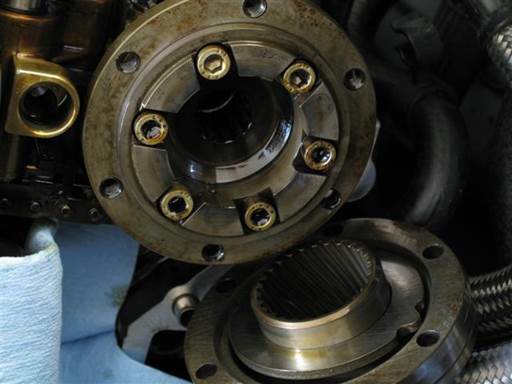 Reassemble splined shaft bearing per above procedure and reassess bearing axial fit. Note: Washers are made from hardened steel and do not easily wear. Sanding procedure will remove ~.0025mm washer height, total ~.005. Washers might need max .01mm height adjustment. If splined shaft has any tilt movement then axial play is present and tightening adjustment is needed. Place sandpaper (300-400 grit) on flat table top. 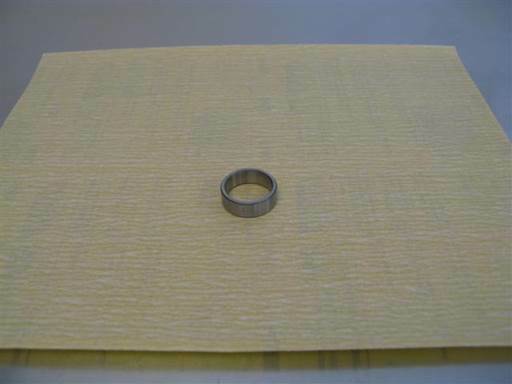 Place bearing ring on sandpaper. Slide ring side to side on sandpaper ~6” back and forth while moderately pressing ring on sandpaper. Perform sanding for 5 seconds. Rotate ring 90 degrees and repeat sanding process. Flip ring to opposite side and repeat above sanding procedure; 5 seconds sanding, rotate 90 degrees, 5 seconds sanding. Clean ring (brake cleaner & towels). Note: Ring is made from hardened steel and does not easily wear. Sanding procedure will remove ~.005mm ring height. Ring might need max .01mm height adjustment. 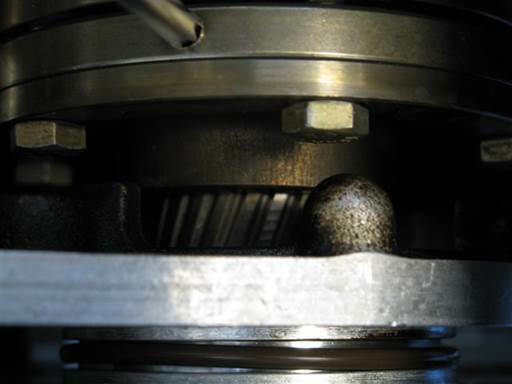 Once splined shaft bearing fit is assessed, and if needed adjustment performed, thread locker needs to be applied to splined shaft cover. 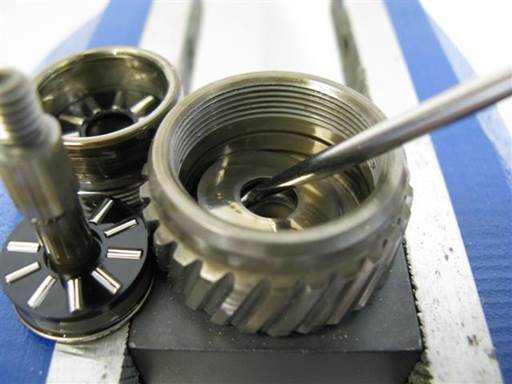 Remove splined shaft cover from splined shaft per above procedure. Apply thread locker at middle of threads along perimeter of cover (high strength thread locker). Reinstall splined shaft cover and fully tighten per above instructions. 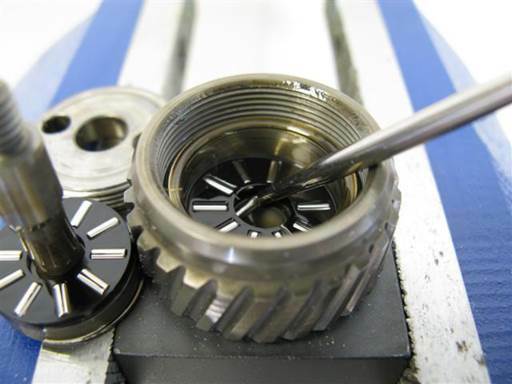 Repeat above splined shaft bearing parts installation procedure for each splined shaft. 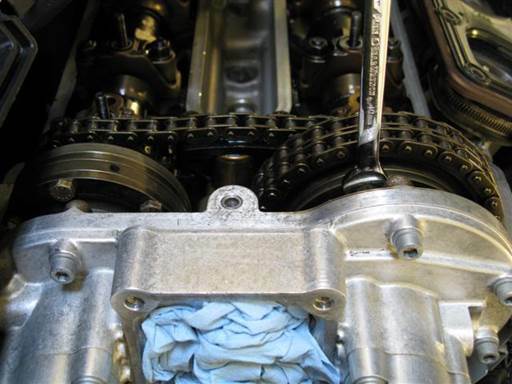 For each vanos perform following splined shafts installation. Thread splined shaft studs into their corresponding pistons; left hand thread. Note: Splined shaft studs and piston threads are left hand thread. 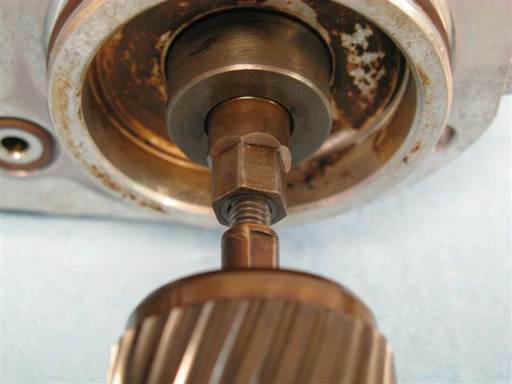 Thus turn splined shaft stud counter clockwise to thread into piston thread. Thread splined shaft studs fully into corresponding pistons by rotating splined shaft studs; left hand thread (hand). 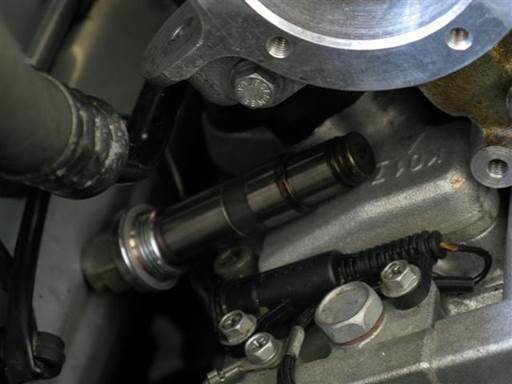 Tighten splined shaft studs to their corresponding pistons; left hand thread (10mm open wrench / 7mm open wrench). Note: Due to left hand thread, it is not necessary to over tighten joint. Repeat above splined shaft installation procedure for second vanos. Clean vanos mounting bolts (brake cleaner & towels). Insert bank 1 & 2 vanos oil input regulator into upper timing cover hole and orient with side oil relief holes to right and left. 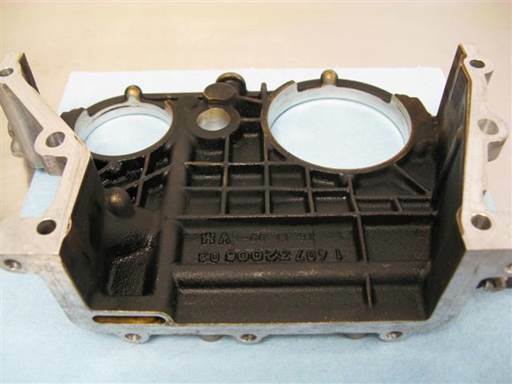 Press bank 1 & 2 vanos oil input regulator into head until flush with upper timing cover face (picture). 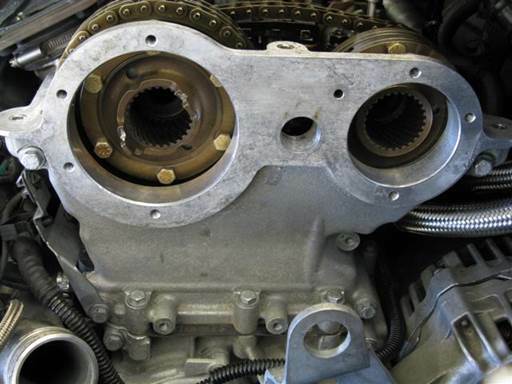 Rotate bank 1 & 2 intake and exhaust hubs clockwise as far as possible. Turn intake hubs by hand at front tabs. Turn exhaust hubs at top hole (T25 torx bit driver). Insert vanos splined shafts with pistons fully into vanos units. Clean all vanos matting surfaces (brake cleaner & towels). Install bank 1 vanos with splined shafts onto sprocket hubs. Note: Vanos units are same and interchangeable. 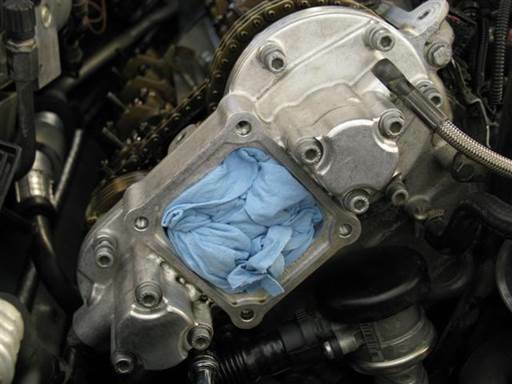 But it’s best practice to maintain vanos to engine head association. Vanos is originally oriented with vanos sticker to bottom. 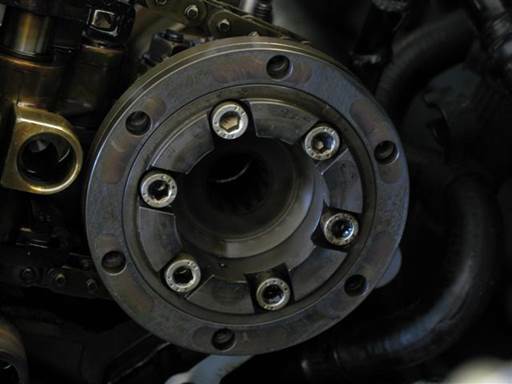 Align and initially insert exhaust and then intake spline shafts into corresponding hubs. 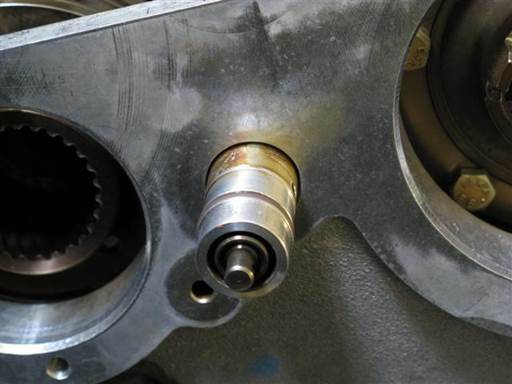 Align exhaust splined shaft to insert into exhaust camshaft hole at center of hub. 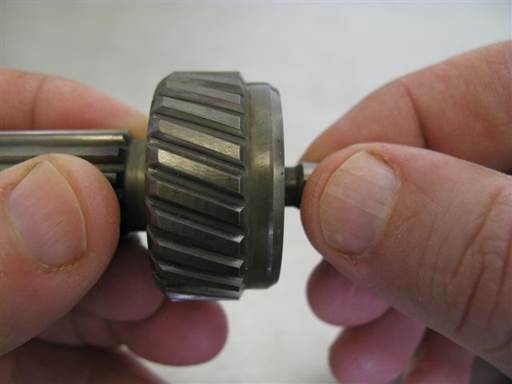 Rotate and insert splined shaft to insert into camshaft. 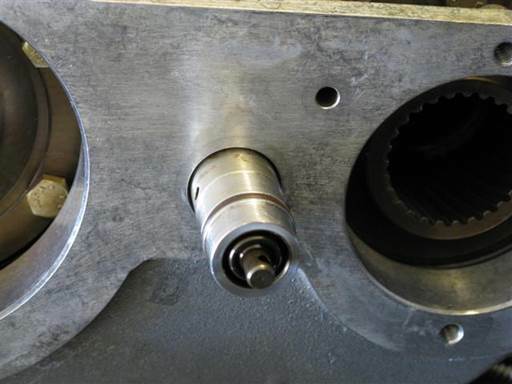 Align intake splined shaft to insert into intake camshaft hole at center of hub. 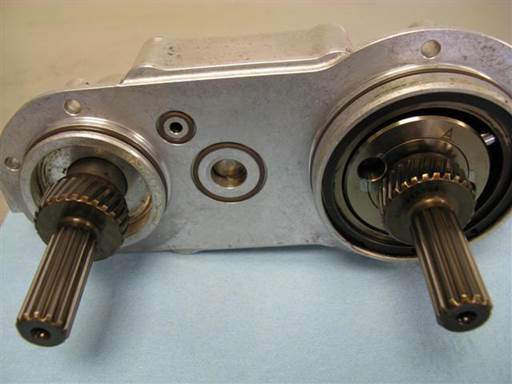 Rotate and insert splined shaft to insert into camshaft. 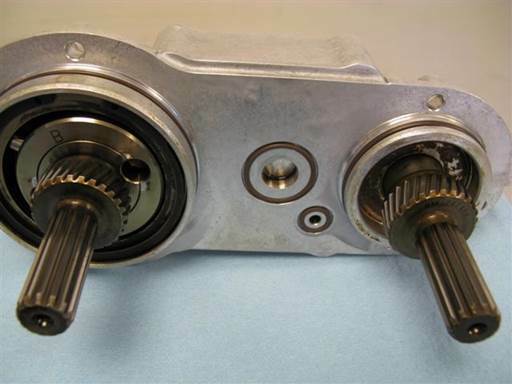 Press vanos onto engine to insert splined shafts into camshafts and bring splined shafts slanted splines up to hubs. Vanos press will also reinsert splined shafts and pistons fully into vanos if they came out. Insert bank 1 exhaust splined shaft slanted splines into exhaust hub. 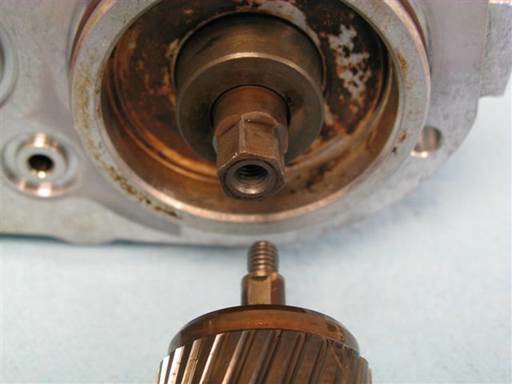 Rotate hub counter clockwise, at hub top hole, while pressing vanos onto hub (T25 torx driver). Splined shaft will insert into hub at first alignment of splines. Caution: Splined shaft must insert into first available aligned hub splines. Insert bank 1 intake splined shaft slanted splines into intake hub. 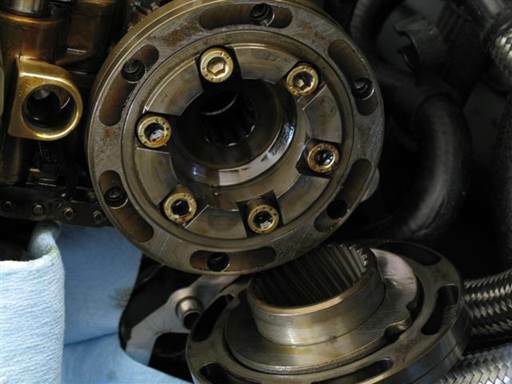 Rotate hub counter clockwise, at hub left tab, while pressing vanos onto hub (T25 torx driver). 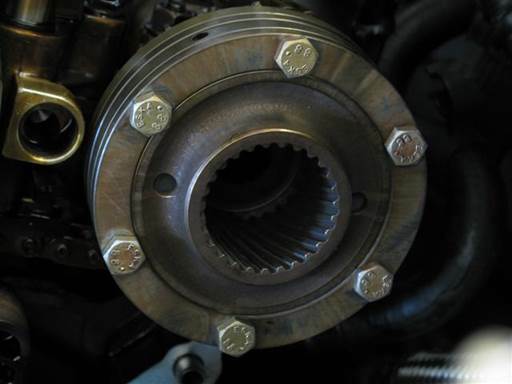 Install bank 2 vanos with splined shafts onto sprocket hubs. Insert bank 2 exhaust splined shaft slanted splines into exhaust hub. Insert bank 2 intake splined shaft slanted splines into intake hub. 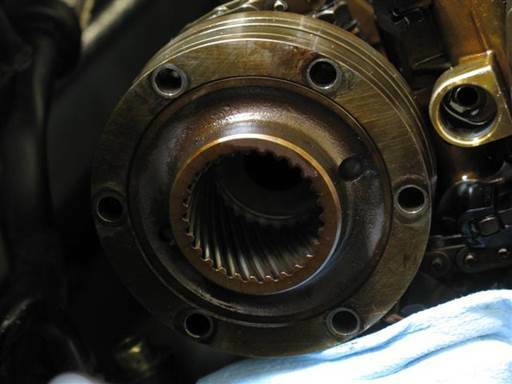 Inspect bank 1 & 2 vanos oil pump side hole and intake sprocket hub driver side tab for alignment. 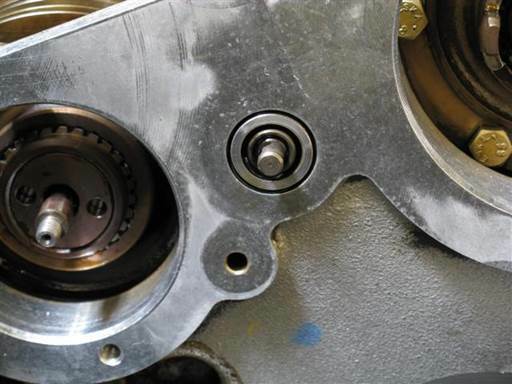 Rotate vanos oil pump as needed to achieve alignment (fingers). 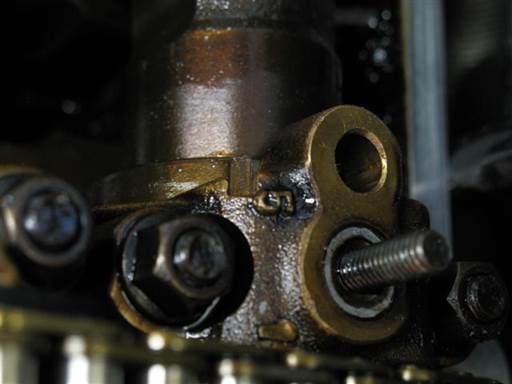 Press banks 1 & 2 vanos unit onto engine head and verify driver tab insertion into oil pump hole. Realign vanos pump as need to facilitate tab insertion (fingers). 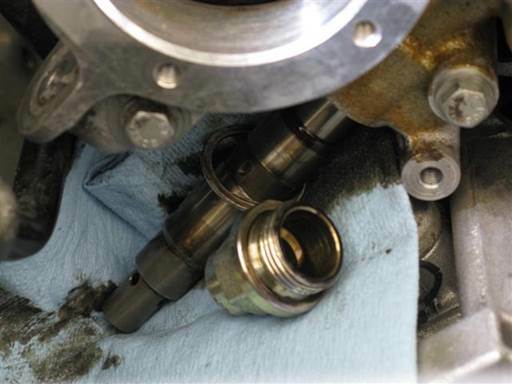 Note: Vanos unit will not fully mate with head due to vanos sealing O-rings. Install bank 1 & 2 vanos right and left side mounting bolt (5mm hex bit socket 3/8” / 3/8” extension). Thread bolts up to vanos. Do not tighten. 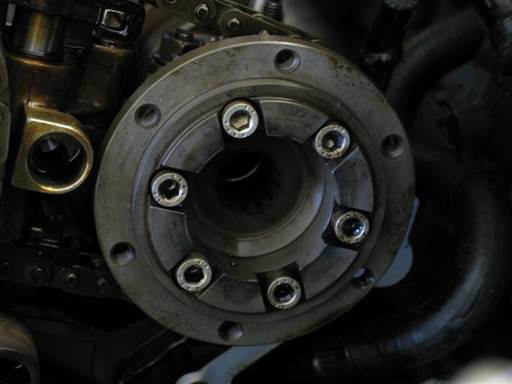 Tighten then slightly loosen banks 1 & 2 intake and exhaust hub top 3 mounting bolts. For each bank perform following. Tighten intake and exhaust hubs top 3 mounting bolts (10mm open wrench). Tighten bolts evenly in multiple passes. Verify one pass with all bolts tight. 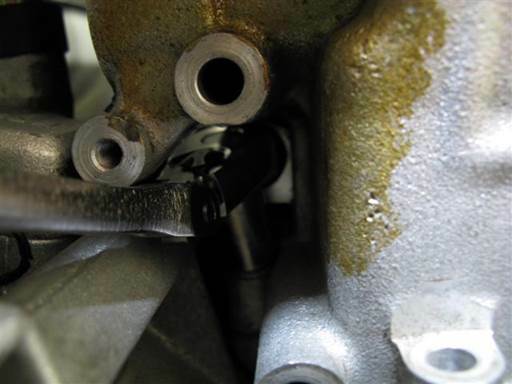 Loosen intake and exhaust hubs top 3 tightened bolts 1/4 turn (10mm open wrench). Install bank 1 & 2 vanos mounting bolts. Perform following for each vanos. 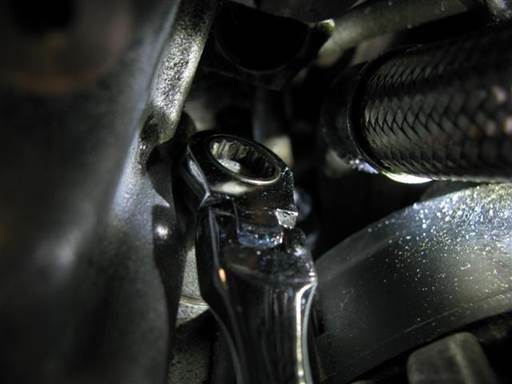 Install vanos remaining 7 mounting bolts (5mm hex bit socket 3/8” / 3/8” ratchet & extension). 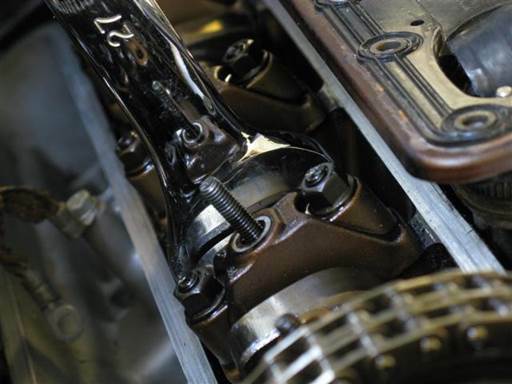 Tighten all bolts evenly in multiple passes to draw vanos to engine head evenly. 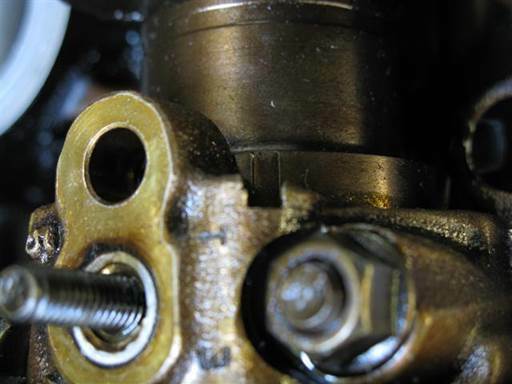 Note: If bolts difficult to tighten then hub top bolts are not loosened sufficiently. 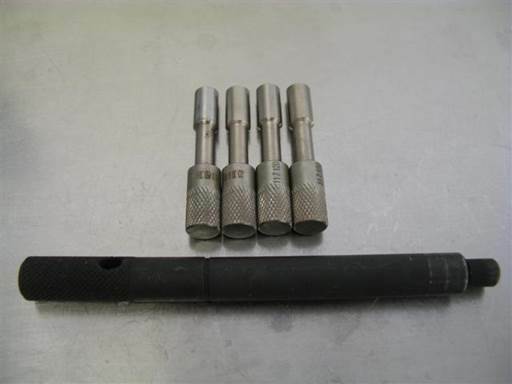 Fully tighten, 10 Nm (7 ft-lb) (5mm hex bit socket 3/8” / 3/8” torque wrench & extension). Fully tighten bank 1 & 2 intake and exhaust hub top 3 mounting bolts. For each bank perform following. Note: Bolts will be mostly tightened since they were tightened in previous step. Note: Bolts will be tightened again in below step, thus do not overly tighten at this time. 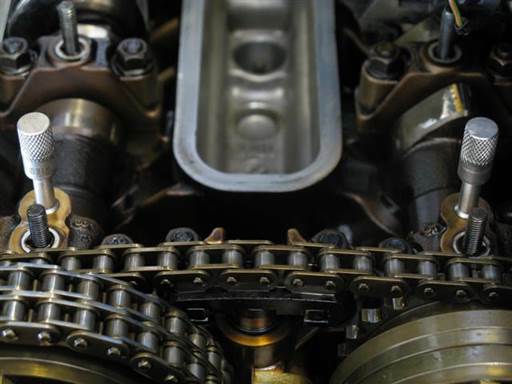 Unlock banks 1 & 2 intake and exhaust camshafts. For each bank perform following. Remove locking pin in camshaft first bearing hole. 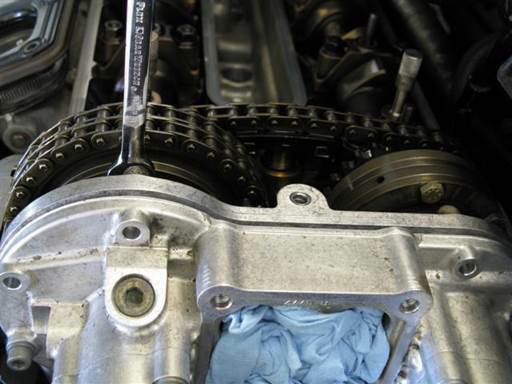 Rock camshaft back and forth (27mm open wrench) while pulling up and removing locking pin. 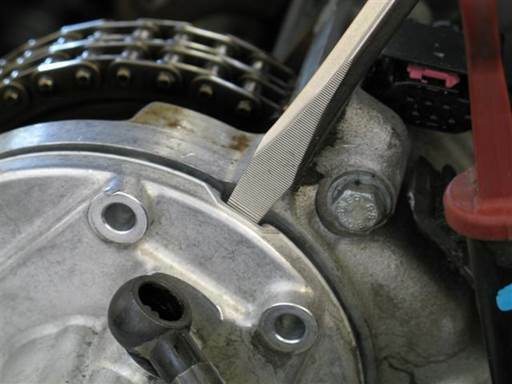 Remove crankshaft locking pin from timing cover bracket. Turn crankshaft pulley clockwise one full rotation until timing marks match again (32mm socket 1/2” / 1/2” long-arm ratchet & extension). 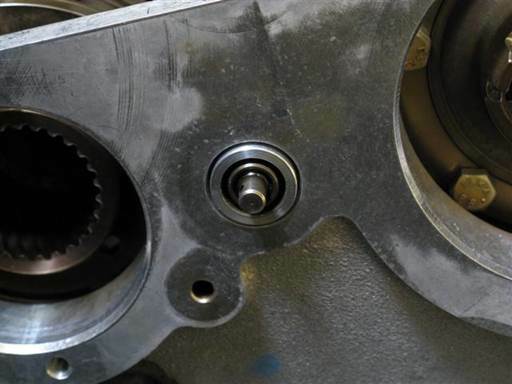 Adjust crankshaft pulley to align TDC timing marks (32mm socket 1/2” / 1/2” long-arm ratchet & extension). Tighten bank 1 & 2 intake and exhaust hub top 3 mounting bolts. For each bank perform following. Fully tighten, 10 Nm (7 ft-lb) (10mm open wrench) (by feel). 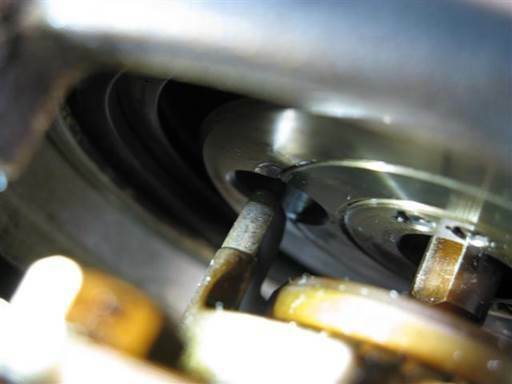 Adjust crankshaft pulley to precisely align TDC timing marks (32mm socket 1/2” / 1/2” long-arm ratchet & extension). Note: Bolts were tightened in previous step and thus will be mostly tightened. 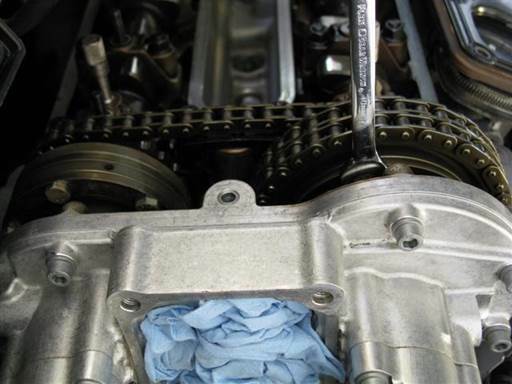 Fully retard banks 1 & 2 intake camshaft timing. 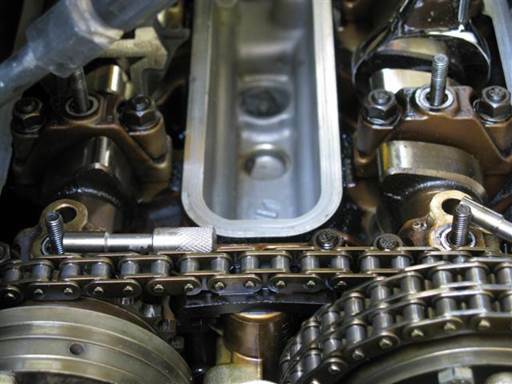 For each intake camshaft perform following. 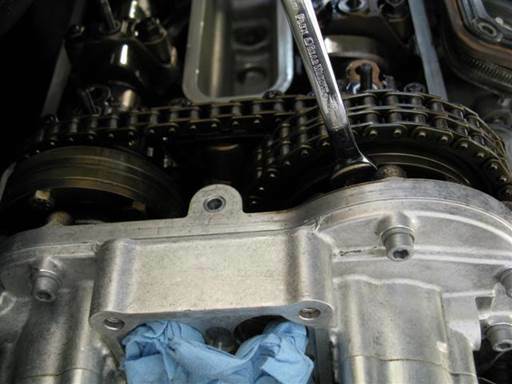 Place open wrench (27mm combo wrench) on intake camshaft hex at front of camshaft. 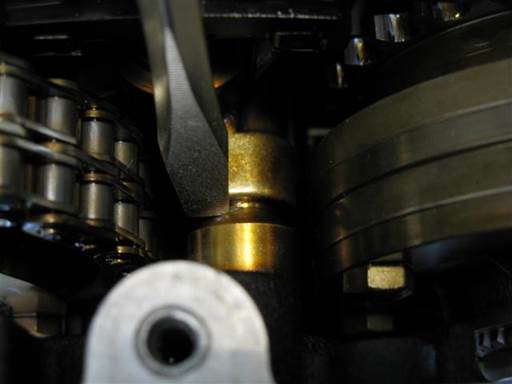 Rotate intake camshaft counter clockwise to adjustment end position. 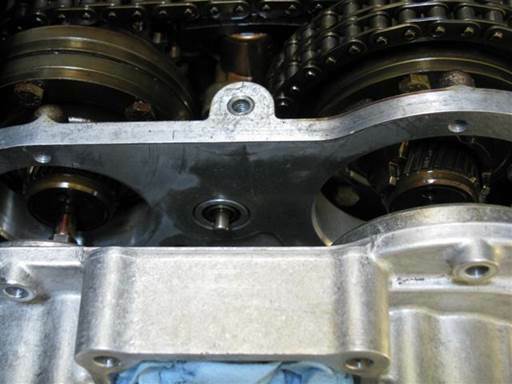 If camshaft resistant to rotation rock camshaft back and forth to release seize. Note: Camshaft rotation is most effective when standing at side of car. 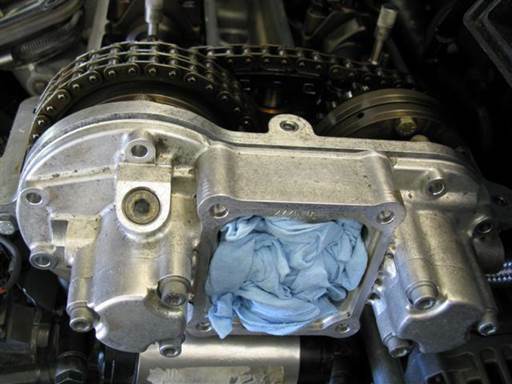 Note: Camshaft should already be in fully retarded position. Fully retard banks 1 & 2 exhaust camshaft timing. 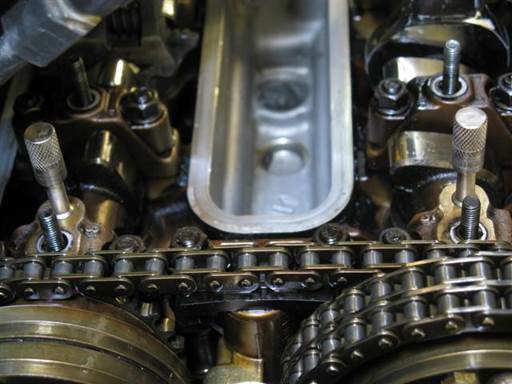 For each exhaust camshaft perform following. 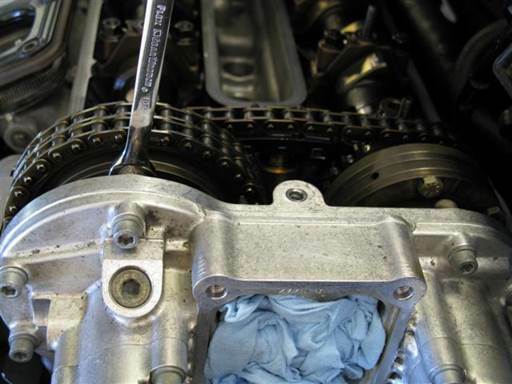 Place open wrench (27mm combo wrench) on exhaust camshaft hex at front of camshaft. Note: Access is limited for standard 27mm open wrench. Use short handle adjustable wrench as needed. 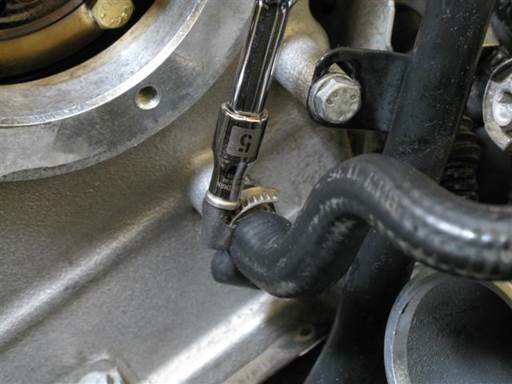 Rotate exhaust camshaft counter clockwise to adjustment end position. 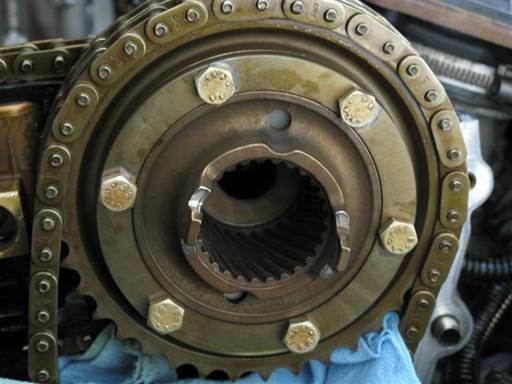 If camshaft resistant to rotation rock camshaft back and forth to release seize. 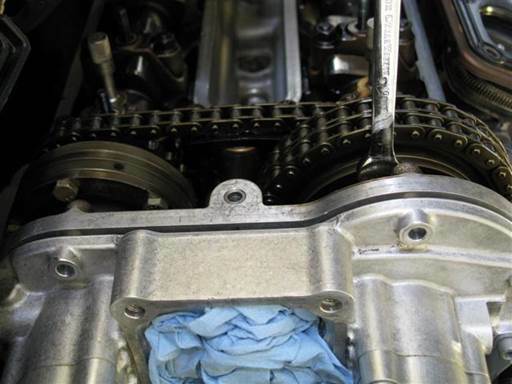 Inspect bank 1 intake and exhaust camshaft timing. 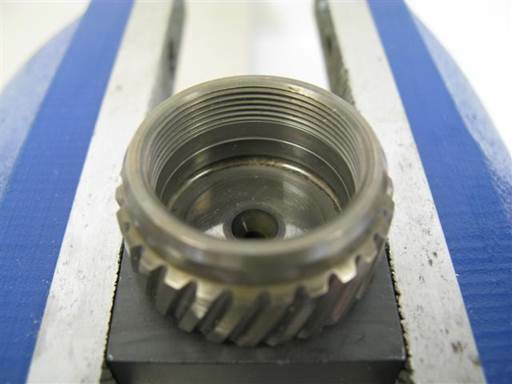 Inspect alignment of notch in camshaft to notch in first bearing cap right side. Notches should align with no more than slight variation. 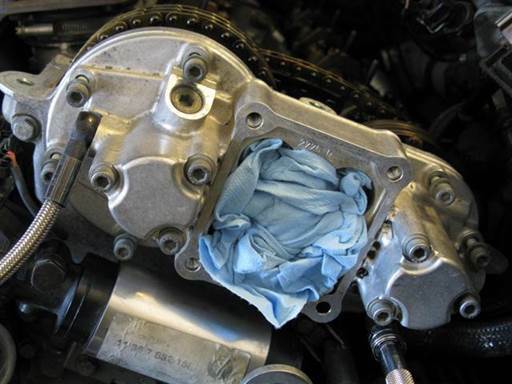 Inspect bank 2 intake and exhaust camshaft timing. 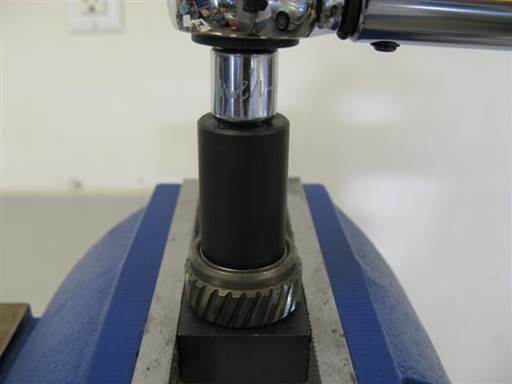 Inspect alignment of notch in camshaft to notch in first bearing cap left side. 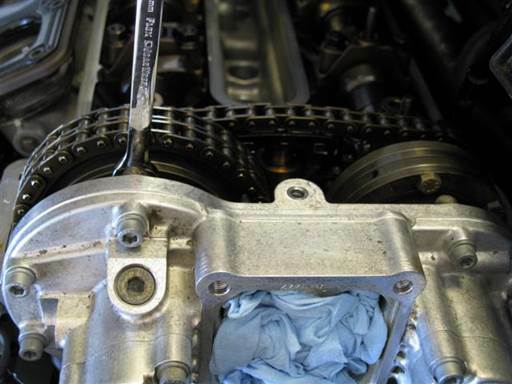 Perform cleaning section in procedure then start at step after installing vanos mounting bolts.